This policy sets out the Commission’s findings on ways to build a future Canadian television system that encourages the creation of compelling and diverse programming made by Canadians. The policy is a result of the process initiated by Let’s Talk TV: A Conversation with Canadians and follows the Commission’s decisions regarding local over-the-air television and simultaneous substitution. The Commission’s policies concerning consumer choice and flexibility and consumer information and recourse will be published in the coming weeks. Canada is home to a thriving television industry that offers a wide range of programming in many languages and in a variety of genres from drama, music and sports to news and documentaries. The Canadian television system presents programming that draws millions of Canadian viewers on multiple platforms. An infrastructure of government support and private investment, which has evolved over the years, generates significant funding opportunities for Canadian programming. Programming is delivered over well-developed and robust distribution systems, which ensure that it is available to Canadians no matter where they live. By building on these strengths, the Canadian broadcasting industry is well positioned to face the future with confidence and creativity in order to compete at home and internationally on a variety of platforms. Over the next several years, Canadians will continue to migrate from scheduled television and packaged programming services to a more on-demand and tailored television environment. Canadians will seek even greater control over the programs they watch and will access video programs on an even wider array of devices. This new environment will require a concerted effort by all players in the broadcasting system, including governments and the Commission, to find new and innovative approaches to support the creation of compelling and diverse programming. The Commission recognizes that, for Canadian-made programming to succeed, it must be widely available and visible. Canadians need more opportunities to discover Canadian-made programming on multiple platforms. In this respect, the Commission will host a summit to engage directly with stakeholders to discuss ways to work together to develop strategies and mechanisms to improve the discoverability and promotion of Canadian programs. The Commission is also providing additional tools to incent the promotion of Canadian programming. Canadians throughout the country should have access to programming, including original Canadian programming, on Canadian-operated online platforms. In view of this, the Commission is creating a new hybrid video-on-demand (VOD) service category and setting the rules that apply to these services. Services operating in this category will be exempted from the requirement to hold a broadcasting licence. This new category will remove barriers for Canadian companies to compete on an equal footing in an on-demand environment. The Canadian production sector plays an essential role in the ultimate success of the future television system. A robust Canadian production sector will be better able to offer compelling high-quality content to Canadians and to global audiences. The creation and promotion of Canadian programs must be supported by appropriate funding models and tools. The Commission is therefore making a number of recommendations to governments and agencies on ways to enable the production sector to grow and evolve in the new video environment. The Commission is also launching pilot projects as well as looking at its own policies for certification to allow for greater flexibility in the creation of Canadian programs. The future success of the broadcasting industry will depend on the industry’s ability to tailor the contents of programming packages as well as the programming itself to the needs and interests of Canadians. Viewer information will be essential in this emerging viewer-centric environment. New tools, such as a set-top box-based audience measurement system, are key. In light of this, the Commission is requiring the industry to form a working group to develop a set-top box-based audience measurement system. Canadians were clear during the Let’s Talk TV proceeding that they expect high-quality content from their television system. In addition to creativity, the production of compelling high-quality programming requires financial investment. Investment in high-quality content that is widely available and well-promoted increases viewing and thereby generates revenues. All of this contributes to an overall success story. To support the production of high-quality programming, the Commission is shifting the focus from a regulatory approach based on exhibition quotas (the number of hours of Canadian programming broadcast) to one based on expenditures (the amount of money spent on Canadian programming). Specifically, the Commission will require expenditures on Canadian programming from a greater number of programming services. At the same time, the Commission will eliminate some exhibition requirements for programming services. However, certain exhibition requirements will remain for those time periods where they have the most impact. The Commission considers that the genre exclusivity policy is no longer needed to ensure programming diversity between services and is therefore eliminating this policy. The policy limited programming services to offering certain types of programming and precluded other services from offering that programming. By eliminating this policy, the Commission is removing regulatory barriers so as to allow entry by new programming services, programming flexibility and greater domestic competition. This will ensure that programming diversity is governed by market forces to the greatest extent possible. Programming services will be able to respond to consumers and adopt creative programming strategies. News services play a vital role in the broadcasting system. The Commission considers that certain regulatory supports must remain in place in order to ensure that Canadians have access to high-quality news and information and are exposed to a diversity of views on matters of public concern. In this respect, the Commission will impose new criteria for new and existing national news services. The Commission is maintaining the existing expenditure requirements on programs deemed to be of national interest. The Commission considers that Canadians must have access to certain types of programs that make an important contribution to the broadcasting system. This view was shared by many Canadians who provided comments during the Let’s Talk TV proceeding. Lastly, the Commission is instituting measures to reduce regulatory burden. The Commission will exempt a greater number of programming services from the requirement to hold a broadcasting licence. The Commission will also consolidate the number of licence classes for programming services to streamline the licensing of services. During the consultation, the Commission received over 13,000 comments and interventions, many of those from individuals Canadians from all parts of the country. The public record for this proceeding, including reports on the comments and input from Canadians received in Phases 1 and 2, can be found on the Commission’s website at www.crtc.gc.ca. In August 2014, the Commission published Broadcasting Notice of Consultation 2014-190-3 (the Working Document) which set out various proposals for the future regulation of the Canadian television system. In the Working Document, the Commission noted that the inclusion of certain proposals should not be seen as an indication that it had made up its mind on any issue or that it preferred one option over another, and that the document was intended only to provide parties with a possible model to stimulate discussion and debate. In Broadcasting Notice of Consultation 2014-190, the Commission stated that these outcomes may be achieved without regulation, through the evolution of the marketplace or the changing technological environment. Should regulatory intervention be warranted, it would only be used where specific outcomes or objectives would not be achievable without intervention. Further, such measures should be as simple as possible, proportionate, easily administered and adaptable to change. This regulatory policy will focus primarily on the first outcome listed above: a Canadian television system that encourages the creation of compelling and diverse programming made by Canadians. The Commission has already addressed a number of issues related to local over-the-air television and simultaneous substitution in Broadcasting Regulatory Policies 2015-24 and 2015-25, respectively. The Commission’s policies concerning consumer choice and flexibility and consumer information and recourse will be published in the coming weeks. In making its determinations in these policies, the Commission must consider the public, private and community elements of the Canadian broadcasting system. Some of the determinations set out in the next sections will take effect at licence renewal. For the private television sector, licence renewals will take place by 31 August 2017 for the large ownership groups and by as early as 31 August 2018 for the independent services, depending on their individual licence expiry dates. The CBC licences will be renewed by 31 August 2018. The Commission will also examine community and local programming more closely in an upcoming review as announced in Broadcasting Regulatory Policy 2015-24. What will “television” look like in 10 years? Although it is impossible to say with any certainty what “television” will look like in the next 5 or 10 years, certain trends and directions are apparent. Over the next several years, Canadians will continue to migrate from scheduled and packaged programming services to on-demand and tailored programs. They will become more active viewers who want even greater control over the programs they watch. Canadian viewers, like viewers around the world, will increasingly consume content on all kinds of devices, and will demand new and innovative approaches to programming. New developments in technology, led by innovative Internet-based services and devices, are already both responding to pent-up consumer demand for content and leading to changes in consumption behaviour among many Canadians (e.g., online and mobile viewing, binge viewing, exposure to new, global sources of content). At the same time, many Canadians will continue to consume content on traditional television platforms in similar ways and amounts as they have for decades. The Commission must therefore devise a regulatory framework that is responsive to the innovative ways in which content can and will be delivered and that recognizes and values the more traditional ways of accessing content for the viewers that wish to continue to engage with television in that way. This new approach must provide for maximum flexibility in how content is created, distributed and watched. Many of the services and companies operating in today’s television marketplace will continue to play important roles in the future environment, some of them will change radically. New innovative video services will appear, while other existing services will cease entirely. Most of these changes will be driven by the interests and choices of viewers in the marketplace, but the Commission will continue to play a role in ensuring that Canadians have a full range of choice, which includes the availability of an array of compelling and diverse Canadian programs. Looking into the future of particular services and companies, the Commission expects that vertically integrated companies (companies that own or control programming services as well as distribution services), for their part, will continue to have the opportunity to leverage their resources and audience reach to acquire popular and lucrative programming as well as be well positioned to produce high-quality programming made by Canadians. Their critical mass provides these companies with the financial capital required to succeed both domestically and internationally. However, given their formidable position in the Canadian market, certain safeguards are necessary to ensure these companies do not exert their market power in ways that would detract from the ability of other content distributors and providers to offer services to Canadians or to limit the choices available to individual Canadians. Conventional television stations will continue, at least in the short to medium term, to be widely available to Canadians both directly over the air and through paid subscriptions to television distributors. Many of these stations, particularly those operated by vertically integrated companies, will continue to have large audiences for big budget Canadian and non-Canadian programming in the evening prime time period. Since these programs will face ever greater competition for audiences, they will need to be of the highest quality in order to be compelling to Canadians. The news and local programming that is also offered by these stations will continue to provide critical connections with audiences and enable Canadians to participate at the community and national levels. However, this content will also continue to be characterized by resource-intensive production relative to the size of the audiences. Linear discretionary programming services (also known as pay and specialty services) will largely continue to provide alternative original programming as well as previously broadcast content. However, the current linear model is likely to lose ground as online video services seek to aggregate long-tail content, i.e. create large inventories of previously aired programs that serve multiple niche audiences. At the same time, licensed pay-per-view (PPV) and video-on-demand (VOD) services, which are already non-linear, are likely to become less and less distinguishable from online video services. Producers will tap into the creative opportunities available as a result of the monetization of new platforms. Compelling programming that caters to world audiences will be the key driver of success in an increasingly competitive environment. greater focus is placed on promotion and discoverability. In short, the future “television” system will be one in which Canadians have a seamless experience when accessing their content of choice. That experience will be the result of mutually beneficial collaboration between the various components of the system: content creators, content aggregators and distributors. through its programming and the employment opportunities arising out of its operations, serve the needs and interests, and reflect the circumstances and aspirations, of Canadian men, women and children, including equal rights, the linguistic duality and multicultural and multiracial nature of Canadian society and the special place of aboriginal peoples within that society. The Commission, as the regulatory authority entrusted with overseeing and regulating the Canadian broadcasting system, must ensure on behalf of the public that these policy objectives are being achieved. Accordingly, the Commission monitors the Canadian broadcasting system and intervenes only when there is evidence that a problem exists in meeting the Act’s objectives that the market cannot resolve. The Canadian television system is a thriving industry that directly employs almost 60,000 people. According to Profile 2014, a report published by the Canadian Media Production Association (CMPA), the Association québécoise de la production médiatique (AQPM), the Department of Canadian Heritage and Nordicity Group, film and television production in Canada accounted for almost $7.5 billion dollars in gross domestic product in 2013-2014. Some Canadian programming is produced by broadcasters in-house while a significant amount is the work of independent producers. For an independent producer, getting the financing for a television program is a complex, detailed and time-consuming process, which involves applications to numerous agencies, as well as securing interim or bridge funding from a financial institution for what is a highly risky venture. Financial support is required to ensure that the necessary resources are available in order for Canadians to create a diversity of programming. And Canada is not alone. Most countries able to sustain a broadcasting system regard having a domestic production industry as an important public good that generates social, economic and cultural benefits. Some of these benefits are intangible and hard to quantify like the importance of telling and hearing your own stories. Others are easily quantifiable such as the number of highly skilled jobs created and the revenues generated. Like Canada, these countries have in place various programs such as subsidies and tax credits to help fund domestic productions, which generate various benefits to society. In Canada, the production industry has significant funding available to it from a number of sources. Some of these are private, such as venture capital loans, equity investments, and pre-sales of programming to international broadcasters. The lion’s share of investment in Canadian programming is public, such as funding for the Canadian Broadcasting Corporation (CBC), and occurs at both federal and provincial levels through program subsidies, including those at Telefilm, or tax credits, such as the Ontario Film and Television Tax Credit. The sources of financial support for Canadian programming can also be more indirect. These include box office revenues for Canadian films eventually broadcast on television, and revenues accrued by broadcasters from the sale of advertising and subscriptions to discretionary services. In the case of the latter, the Commission requires most broadcasters to contribute a portion of their revenues from these and other activities directly to Canadian programming. Between 2010 and 2014, the CMF alone has contributed more than $1.4 billion to 1,923 television programs and 335 digital media content and software applications, triggering a total of $4.8 billion in production of Canadian content. As such, each $1 of funding provided by the CMF results in $3.38 towards the creation of Canadian programming. These various supports play a crucial role in the funding of programs. 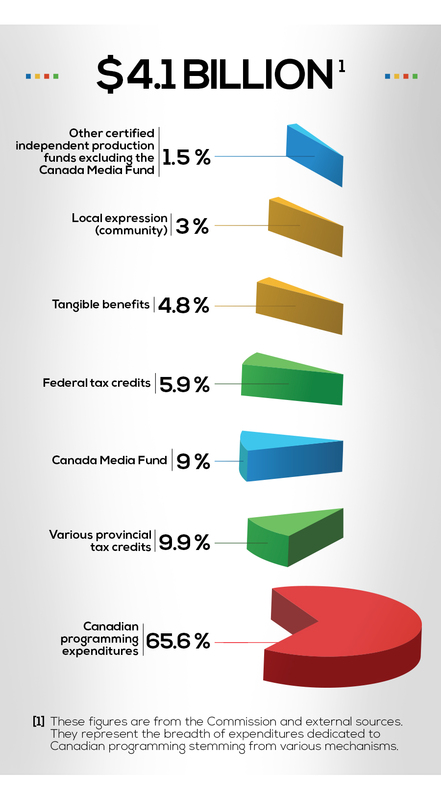 According to the CMF’s 2013-2014 annual report, 26% of the production budgets in the English-language market for programs funded by the CMF came from the CMF itself, and 27.5% from other federal and provincial sources such as tax credits and agency funding. For the same productions, English-language broadcasters contributed 29% through their expenditures on Canadian programming, whereas producers themselves contributed a total of 4% of the budgets. In the French-language market, the CMF contributed 27% of production budgets and other federal and provincial sources 28%. French-language broadcasters contributed 42% and producers 1.7% of those production budgets. This infrastructure of government support and private investment that has evolved over the years generates significant funding opportunities for Canadian programming. While undoubtedly, the Canadian broadcasting system is experiencing a profound transition, evidence suggests that it is not in crisis. That is because it has built, over decades, a solid foundation of resources and talent that will enable it to face the future with confidence and creativity. This confidence and creativity will be crucial to meeting the coming challenges. It is not only technology and consumer behaviour that has been changing, but also the notion of “quality television.” In recent years, television dramas have become more theatrical, more movie-like, with top film talent migrating from the big screen to the small screen in pursuit of greater opportunities to innovate and take risks in storytelling. One innovation has been the creation of fewer episodes per season in order to devote more resources per episode, thereby enhancing the quality of these productions. The measures that the Commission is introducing in this policy are therefore with a view to responding to the profound shifts happening in what Canadians understand as television. Canadian creators are up for the challenge. In the sea of content available on any number of platforms, Canadian programming will not only have to be “discoverable,” it will have to be chosen-this will require a concerted effort on the part of every single element of the system through the entire production and distribution chain. In such an environment, Canadian programming will have to become increasingly independent of regulatory supports such as content quotas. world-class creative and technical personnel and production facilities. The Canadian television system presents programming that draws millions of Canadian viewers on a variety of platforms. Programming is delivered over well-developed and robust distribution systems, which ensure that it is available to Canadians no matter where they are in the country. Canada possesses a thriving industry that offers a wide range of programming in multiple languages and in a wide array of genres from drama, music and sports to news and documentaries. This programming is created in many regions across the country. Canadian French-language programming, be it television or film, is highly successful and enjoys the benefits of a well-developed star system and deeply engaged audiences. While English-language programming does not enjoy all of the same benefits, viewership to Canadian programs is strong and growing and numerous popular English-language Canadian programs are widely viewed by Canadian and foreign audiences. NFB.ca offers free streaming of documentary and animated films as well as interactive stories. The National Film Board launched this online screening room in 2009, which streams titles in English and French. Since then, it has received over 57 million views of its programming, which features over 2,000 films, excerpts, trailers and interactive works. Tou.tv is a French-language on-demand web television site, created by the CBC that brings together 20 national and international producers and broadcasters. It offers a vast array of television programs, series and variety shows, documentaries and newsmagazines. Club Illico is the standalone online video service offered by Videotron. Launched in 2013, it now has over 111,000 subscribers. Another Canadian success is Éléphant, a non-profit project dedicated to Quebec’s cinema heritage and to making it available on new platforms. Since 2008, it has digitally remastered over 200 films and recorded more than 250,000 orders, through various platforms, resulting in an estimated half-a-million viewers to its library. These are the strengths on which to build the ultimate success of the future Canadian television system. When these strengths are leveraged, the Canadian television industry is well positioned to compete at home and internationally on multiple platforms. In general, many English-speaking Canadians choose to watch U.S. programming, with certain exceptions, such as sports and news. It is less expensive to acquire American programming (which has already covered its costs in its domestic market) than to produce Canadian programming. Moreover, Canadian programming is less profitable for Canadian broadcasters than U.S. programming. Without regulatory intervention, market forces thus tend to focus English-language private broadcasters in Canada on the acquisition and exhibition of American programming. This programming also benefits from Hollywood’s promotional power and its well-established star system-by comparison, both relatively lacking in English-language Canada. On the other hand, English-language Canadian programming enjoys international success through export sales. While Francophone Canadians prefer French-language Canadian programming, it is not in sufficient supply to meet the demand. That is because the French-language market in Canada is small and struggles to self-sustaining production industry. Further, international sales are a challenge. However, French-language Canadian programming benefits from domestic promotion and a star system. As neighbours to one of the most successful cultural producers in the world, Canadians have never been strangers to globalization and the ways in which changes in communications technology can seemingly pose a threat to national identity and to the ability to develop as cultural producers in their own right. Rather than closing off Canadians from the content of another country and using technology to build a closed Canadian broadcasting system, the Commission responded in another way: it developed regulations so that Canadians could enjoy foreign content while building the domestic industry to ensure a space for Canadian creativity, storytelling and perspectives. This approach has created a system that is the envy of the world-one that has remained open to foreign programming and services, while ensuring a space for Canadian expression. This served as a winning approach, and created a solid foundation on which to build. For decades, the Canadian broadcasting system was a relatively closed system in which it was possible to limit the supply of foreign programming in an effort to create a demand for Canadian programming through exhibition quotas. Today, with the emergence of new broadband platforms, the supply of foreign programming is seemingly limitless. This situation has rendered it difficult to sustain a quota-based approach to creating domestic demand for Canadian programming. Moreover, domestic demand is no longer sufficient for the production industry to continue to thrive when it is faced with content offerings from around the world. In order to adapt to this new configuration of supply and demand, Canadian programming must seek out and develop international audiences. In the past, with the support of various cultural institutions, policies and taxpayer contributions, Canadian creators were able to meet many of the challenges and opportunities that came with Canada’s proximity to the U.S. This experience has made us well equipped to meet a future in which communications technology puts us in proximity with the rest of the world and its endless array of cultural offerings. In this new world, the cultural production of Canadians must stand out. Canadians have access to and are watching compelling Canadian programming that reflects a diversity of viewpoints on a variety of platforms. Broadcasters are motivated to invest in compelling content made by and for Canadians, generating revenues that are, in turn, reinvested in the creation of content. Broadcasters are better able to respond to consumers and adopt creative programming strategies. Regulatory barriers to entry, to programming adaptation and to domestic competition are removed. Program diversity is governed by market forces to the extent possible. Television content is more accessible to all Canadians. The regulatory framework is simplified and less administratively burdensome. With regard to the linguistic duality of Canadian society, under section 3(1)(d)(iii) of the Act, the Commission has the duty to ensure that the Canadian broadcasting system serves the needs and interests, and reflects the circumstances and aspirations, of Canadians. Under section 3(1)(k), it also has the duty to ensure that a range of broadcasting services in English and in French shall be extended to all Canadians as resources become available. Further, as a federal institution, the Commission has the duty under section 41 of the Official Languages Act to ensure that positive measures are taken to enhance the vitality of the English and French linguistic minority communities in Canada, support and assist their development and foster the full recognition and use of both English and French in Canadian society. Section 3(1)(c) of the Act also states that English- and French-language broadcasting, while sharing common aspects, operate under different conditions and may have different requirements. As such, the Commission must consider the conditions and requirements of the two linguistic markets, which include the linguistic minority communities, in making its determinations. In the following sections, the Commission introduces measures to facilitate and take leadership in the transition to an increasingly on-demand environment. Some of these measures speak to the need for new approaches going forward, particularly to ensure that Canadian programming is visible and discovered, to remove barriers for Canadian companies to allow them to compete on an equal footing in an on-demand environment and to support the creation and promotion of Canadian programs with appropriate funding models and tools. Other measures aim to continue the shift from exhibition quotas (the number of hours of Canadian programming broadcast) to expenditures (the amount of money spent on Canadian programming) in order to emphasize quality Canadian programming rather than its quantity and to provide regulatory support for types of programming deemed to be of public interest but only when market failure is demonstrated. Lastly, the Commission is instituting several measures to simplify and streamline the licensing of services in order to reduce regulatory burden. Recognize the importance of promotion and discoverability to the success of Canadian-made programming and the need for all players in the broadcasting system to work collaboratively. Canadians have more opportunities to discover Canadian programming on multiple platforms. Canadian programming is better promoted both here and abroad with a view to creating more successful content made by Canadians. In Broadcasting Notice of Consultation 2014-190, the Commission stated that it would be prepared to consider various incentives to ensure the promotion of Canadian programming so that such programming can be discovered by Canadians. In the growing on-demand environment, viewers have more control over what they watch and when. More content is available to them from international and domestic sources than ever before. How viewers find the content they want to watch is evolving. Due to the size of the on-demand content libraries, various methods are currently used to promote or suggest content to viewers. Algorithms may be used by services to suggest content that may be of interest to their viewers based on their historical preferences. Other services may choose to play a more curatorial role and showcase certain works. In this environment, how Canadian programming is discovered and promoted will be critical to its success. Discoverability is more of a challenge domestically for English-language Canadian programming than it is for French-language Canadian programming. However, given the vast array of content available on numerous platforms, discoverability is an international challenge for both English- and French-language Canadian programming. It is even more of a challenge for independent broadcasters who do not have the reach and profile that the vertically integrated companies have. In either case, promotion is an essential means to ensure awareness and access to Canadian programming. In the French-language market, parties such as Union des Artistes (UDA), Société des auteurs de radio, télévision et cinéma (SARTEC) and Association des réalisateurs et réalisatrices du Québec (ARRQ) expressed the general view that it is up to broadcasters to promote Canadian programming. They noted that this is not a problem in the French-language market where programs already benefit from promotion. Parties in the English-language market generally considered the discoverability of Canadian programming as increasingly important in light of changes in technology and consumption. They supported the Commission’s proposal to consider incentives to ensure the promotion of Canadian programming. Both Irene Berkowitz of Ryerson University and Entertainment One (eOne) discussed the importance of rebranding Canada as an exporter of global hits, to make Canada’s brand known as a creative brand. In their view, Canada is currently known primarily as a country with strong production crews and good financial incentives, but with no track record of producing real global hits. At the hearing, eOne stated that it would welcome the opportunity to participate in a roundtable discussion to share its data and discuss case studies with interested industry stakeholders in order to further discussion. In her final submission, Ms. Berkowitz stated that she had spoken with eOne since the hearing and together they would support a working group to implement strategies to achieve the goal of global hits. The Ontario Ministry of Tourism, Culture and Sport, and creative groups including the Alliance of Canadian Cinema, Television and Radio Artists (ACTRA), Directors Guild of Canada (Directors Guild) and Writers Guild of Canada (Writers Guild), supported the idea of allowing promotion expenses to count towards the Canadian programming expenditure (CPE) requirements imposed on programming services, as long as they were incremental and not at the expense of production. The vertically integrated companies, on the other hand, supported promotion as an allowable expenditure, but not if it meant increasing CPE requirements. Rogers suggested that the Commission could limit the measure’s impact by restricting such expenditures to programs broadcast in the prime time hours of 7 to 11 p.m. only. With regard to a proposal that expenditures on the promotion of programming be counted as CPE, Bell proposed that only third-party (i.e., parties not affiliated with the producer or broadcaster of a program) promotional costs should be eligible for CPE purposes, up to a maximum of 10% of eligible spending on Canadian programming. Corus supported this proposal, while the CMPA argued that this figure is too high, since it would be almost as much as the amount of CPE allotted to programs of national interest. Shaw indicated that its budget for third-party promotion was small and includes billboards, subway posters, and other items geared towards interesting viewers in a particular program. The CMF stated that it funds a specific list of eligible marketing expenses and that this list currently allows a greater proportion of marketing expenses in the budgets that it funds than it has historically. This change was made to encourage promotional activities, such as social media campaigns related to television programs and their digital components. The CMF further stated that it is expanding the definition of what it considers eligible marketing expenses. The way in which local availabilitiesFootnote 5 are currently used garnered some criticism from parties. Pelmorex proposed that on a fair and equitable basis, at least 50% of advertising availabilities on foreign services should be made available to licensed independent television programming services at no charge. This was supported by the CBC. Anthem Media and Blue Ant Media saw local availabilities as an important way to promote their services. Pelmorex also made proposals about a barker channel and electronic program guide with at least 50% of airtime being made available to independent programming services at no charge. In its intervention, Telefilm Canada suggested a fund to promote Canadian feature films. In the past, television broadcasters were the sole content curators, determining which shows were broadcast and when. They were the primary link between the content creators and the viewers. Technology and the emergence of new broadband platforms has challenged these relationships. In this changing environment, creators will need to seek out new and innovative approaches to connecting with audiences. The Commission recognizes that in the French-language television market, the presence of a healthy star system has made promotion virtually a non-issue within Canada from a regulatory perspective. With respect to both English- and French-language programming, the Commission is of the view that more promotion of Canadian programs will lead to enhanced visibility and discoverability by Canadian and international viewers, which in turn will lead to more viewership, revenue and further investment. The Commission considers that discoverability is critical to the success of Canadian programming in the future. The migration from scheduled and packaged programming services to a more on-demand and tailored television experience is changing the way viewers are finding and discovering Canadian programming. How the industry adapts its promotional efforts in this new environment will ultimately dictate the success of Canadian programming both here and abroad. Although many parties in both the English- and French-language markets acknowledged the importance of promotion and discoverability, few concrete proposals were put forward to deal with the matter. Therefore, the Commission, as the federal organization mandated to regulate and supervise matters relating to broadcasting in Canada, will convene a summit on discoverability in order to engage stakeholders in a discussion on best practices going forward. The Commission will invite a diverse group of participants including government and industry stakeholders to work together to develop strategies and mechanisms to improve the discoverability of Canadian programs. This summit will take place in the fall of 2015. Currently, promotion expenses, including third-party expenses, do not generally count towards the CPE requirements imposed on programming services. The Commission considers that for vertically integrated companies, there are already numerous opportunities to cross-promote programming on various services and platforms. The larger budgets available to the programming services owned or controlled by vertically integrated companies enable a greater scale and scope of promotion than those of which independent programming services are capable. Vertically integrated companies also benefit from considerable synergies in the promotion of their Canadian programs on their own services and have little need to cross-promote on other programming services. Moreover, vertically integrated companies are allocated more funds by the CMF than independent programming services, both due to the number and scale of productions they undertake and because they tend to have greater audiences overall for their programming and are therefore better able to meet the performance-based criteria of the CMF. Over the course of the hearing, the Commission consistently heard about the importance of promotion, and particularly, the problem of discoverability for independent programming services, which do not benefit from the aforementioned advantages. In light of the above, and taking into consideration the Commission’s determinations relating to CPE requirements set out in a later section, the Commission considers it appropriate to implement certain measures with respect to third-party promotion as it relates to independent programming services. Specifically, as of today’s date, the Commission permits independent programming services, i.e., all programming services not affiliated with a vertically integrated company, to count expenses for third-party promotion of Canadian programs towards a maximum of 10% of their CPE. Eligible expenditures will include any payments made to other broadcasters for paid promotional time. In addition, the Commission adopts the CMF’s list of eligible marketing expenses as eligible expenditures under this policy, provided that these payments are made to parties not affiliated with either the broadcaster or producer of the program. All expenditures unrelated to those listed are excluded. At least 75% of these local availabilities must be made available-on a first-come, first-served and cost-recovery basis-for use by licensed Canadian programming services for the promotion of their respective services, for the promotion of the community channel and for unpaid Canadian public service announcements. These promotions can be for BDU-related programming services (including radio services). A maximum of 25% of the local availabilities may be used to provide the BDU’s subscribers with information regarding customer service and channel realignments, and for the promotion of discretionary programming services and packages, cable FM service, additional cable outlets and non-programming services, including Internet and telephone services. BDUs are not permitted to sell and insert commercial advertising in local availabilities. Although in the longer term, local availabilities are likely to be of less and less importance, at the present time, they continue to represent a useful tool for the promotion of Canadian programming. Taking this fact and the various concerns raised by interveners into consideration, the Commission has decided to maintain its current policy for the use of local availabilities with certain adjustments. At least 75% of local availabilities must be made available in each broadcast day for use by licensed Canadian television programming services, in an equitable manner and on a cost-recovery basis, to promote first-run, original Canadian programs. BDUs will be able to continue to use the remaining 25% of local availabilities to promote their broadcasting and telecommunications services as set out in the current authorization. The Commission will use audits both on a random basis and in response to complaints to ensure compliance and prevent abuse. As part of these audits, the Commission will examine the costs charged by BDUs to programming services for the promotion of programs in order to ensure that these costs do not exceed the recovery of normal costs related to the insertion of promotions. It will also examine whether the promotional messages are being used inappropriately to promote sponsors. The regulatory policy setting out the general authorizations for BDUs will be updated accordingly. VOD services are able to compete on an equitable regulatory footing with online video services. Canadians throughout the country have access to programming, including original Canadian programming, on Canadian-operated online platforms. The definition of broadcasting revenues for licensees is revised to include revenues from programming offered online or on other exempt platforms. Broadcasters will be allowed to count towards their CPE requirements their expenditures on original online-only programming. BDU-specific VOD: The VOD service that often comes with a subscription to a BDU. This service can include on-demand access to programs that are broadcast as part of various television services, pay-to-view movies and other content as well as certain free content. These services operate under a VOD licence or, for services operated by BDUs with fewer subscribers, under an exemption order (Broadcasting Order 2011-60). Online video services: Although there are a number of business models for these services, they frequently consist of packages of programming sold by subscription. In some cases, these services are only available to those viewers that also subscribe to a BDU service (referred to here as authenticated services or authentication). These Canadian and non-Canadian services are eligible to operate as exempt undertakings under the Digital Media Exemption Order (DMEO) (Broadcasting Order 2012-409) provided that they are fully accessed and delivered over the Internet or over a mobile service. 5% of gross annual revenues are to be contributed to an existing Canadian program production fund administered independently of the undertaking. Further, licensed VOD services are prohibited from offering programming on a subscription basis that would be competitive with a genre-protected (i.e., a Category A) specialty or pay service. Online video services operating as exempt undertakings under the DMEO are not subject to any of the requirements above. Historically, programming services such as conventional television stations and specialty services have acquired exclusive rights to broadcast programs. As such, an individual programming service may be the only service that broadcasts a particular program or series. However, the Commission has traditionally required that programming services be available to all BDUs and not be exclusive to any particular one. In this way, most Canadians have access to programs that have been acquired on an exclusive basis. Most VOD services are linked to a specific BDU that is tied to a locality and can only be accessed through a subscription and the particular technological platform used by that BDU. As a result, these VOD services have specific obligations that are similar to programming services but also have restrictions similar to those imposed on BDUs. For example, the Commission does not permit these VOD services to hold exclusive content. The intent of this rule is to avoid situations where consumers must subscribe to a particular BDU in order to access exclusive programming. In the DMEO, the Commission applied a somewhat different approach to exclusive content related to how the content is accessed. Specifically, the DMEO prohibits services from providing exclusive access to programming designed primarily for television where access to such programming is restricted based on a consumer’s subscription to a specific mobile or Internet service provider. Exclusive content is therefore permitted provided that it can be accessed by subscribers of more than one mobile or Internet service provider. For example, a made-for-TV program cannot be offered exclusively by a service such as Global Go if it can only be accessed through the Shaw Internet service platform. However, it could be offered exclusively by Global Go if the program can be accessed through other Internet service providers in Canada. Exclusives are also permitted for exempt undertakings when content has been made specifically for mobile or online consumption, whether or not the service is linked to the subscription of a particular mobile or Internet service provider. Many interveners commented on the perceived regulatory asymmetries between licensed and exempt services. Some parties, principally those representing the creative sector, recommended that the Commission enforce regulatory symmetry by imposing obligations on exempt online video services, both foreign and domestic. Vertically integrated companies generally opposed any measure that would put them at a further competitive disadvantage with foreign online video services. Shaw, for instance, expressed concerns about exacerbating the current regulatory asymmetry between licensed services and exempt online video service providers, a view also shared by Bell. Canadian content will be our distinguishing feature. As we grow our [online video] services, new Canadian content will be created for distribution on both the traditional linear platform and new digital platforms. Canadian broadcasters will have every incentive to distinguish their offerings in the online world by developing distinct content that will attract audiences to that platform. Quebecor argued that the ban on exclusives on BDU-specific VOD services is inhibiting the ability of its service, Club Illico, to compete with foreign online video services. It also cited genre protection as an impediment, i.e., it cannot buy content exclusives that would put it in competition with the movie service Super Écran. Quebecor argued, moreover, that the consumer increasingly does not see the difference between traditional and online VOD services-hence, its own multiplatform on-demand approach. Quebecor stated that this is, in part, a strategy to maintain BDU subscribers. It asked the Commission to eliminate the prohibition against content exclusives on VOD services and all other platforms (online and mobile), and against advertising on VOD services. Also discussing exclusivity for BDU-specific VOD services, Lemay-Yates Associates commented at the hearing that the current ban does not provide incentives to invest in programming, obtain the rights to that programming, leverage those rights to make money, and sell them internationally. The Commission considers that it is not appropriate at this time to revise the definition of broadcasting revenues for licensees to include revenues from programming offered online or on other exempt platforms. Doing so, could stifle innovation and inhibit the ability of licensees to offer new online-only programming, in competition with online video services. The Commission is of the view that the industry should be given the opportunity to further develop these platforms without requiring contributions from these services at this time. In this respect, the Commission also reaffirms its view that licensing digital media broadcasting undertakings is generally not necessary to achieve the broadcasting policy objectives set out in the Act. For the time being, exemption of these services will enable continued growth and development of digital media industries in Canada, thereby contributing to the achievement of broadcasting policy objectives. The Commission will therefore not initiate a general review of the DMEO at this time. The Commission will, however, expand its exemption order for VOD services. VOD services, both traditional and online, increasingly face direct competition from foreign online video services, a trend expected to continue. The Commission expects that audiences to on-demand services will continue to grow as Canadians exercise more control over their viewing experience. 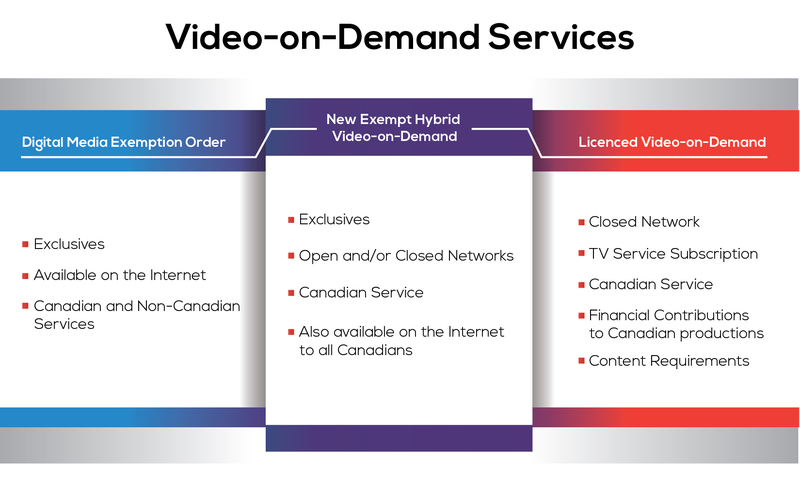 As noted above, online video services operate as exempt undertakings under the DMEO, while Canadian VOD services on BDU platforms generally operate under a range of regulatory requirements not applicable to online video services. Sections 3(1)(k) and 3(l)(s)(ii) of the Act respectively state as objectives that a range of broadcasting services should be extended to all Canadians and that private networks and programming services should be responsive to the evolving demands of the public. Canadians throughout the country have access to programming, including original Canadian programming, on an on-demand basis, whether through traditional BDUs or online. The rules and expectations that apply to each service are clear. As BDU-specific services offered under a VOD licence or the VOD exemption order. Online video services offered under the DMEO. The BDU-specific services operate under clear rules, which include the regulatory framework for VOD services set out in Broadcasting Regulatory Policy 2010-190 and the standard requirements for VOD services set out in Broadcasting Regulatory Policy 2014-444. They must also abide by the conditions set out in their licences or, in the case of the exempt VOD services, those conditions set out in their exemption order. Similarly, there are different but equally clear rules that apply to online video services under the DMEO. However, as new VOD services emerge and business models evolve, the Commission is concerned that it may not be clear what rules apply to new services. In this regard, the Act is clear that in order to operate in Canada, a broadcasting undertaking must be authorized by the Commission, either under a licence or through an exemption order. Services must abide by all the terms and conditions of that authorization. These principles apply equally to VOD services, whether operated under a licence or under an exemption order. Accordingly, if a VOD service is offered on a closed BDU-specific platform it must adhere to all the requirements of a VOD licence or the VOD exemption order. In order to operate under the lighter regulatory requirements of the DMEO, an online video service must be fully accessed and delivered to Canadians over the Internet.Footnote 6 While it may be possible to operate a service to some extent under both regimes, the different regulatory rules that apply to each, particularly in regard to exclusivity as described above, would preclude the possibility of offering an identical service over both the Internet and the closed BDU platforms. In light of the new and evolving nature of many VOD services, the Commission considers it appropriate to authorize a third category of VOD services based on a hybrid regulatory approach. The Commission will authorize these hybrid services to operate with the same flexibility as those services operating under the DMEO, provided certain conditions are met. In this regard, the Commission will amend and expand the current exemption order for VOD services in order to include hybrid VOD services as a new type of exempt undertaking. The Commission is satisfied that licensing these services will not contribute in a material manner to the implementation of the policy objectives set out in section 3(1) of the Act, while exempting them will contribute to implementing sections 3(1)(k) and 3(1)(s)(ii) of the Act. the ability to offer their service on a closed BDU network in the same manner as traditional VOD services without the regulatory requirements relating to financial contributions to and shelf space for Canadian programming that would normally be imposed on those traditional VOD services. However, in order to be eligible for exemption under the expanded order, the services must also be offered on the Internet to all Canadians without authentication to a BDU subscription. In Broadcasting Notice of Consultation 2015-87, also issued today, the Commission is seeking comments on the wording of the amendments to the exemption order. A robust Canadian production sector better able to offer compelling high-quality content to Canadians and to global markets. As outlined in an earlier section, the funding of Canadian programming is a highly complex model of direct and indirect financial supports, including licence fees from Canadian broadcasters, tax credits from the federal and provincial governments, funding from the CMF and independent funds, venture capital loans and equity investment. As one part of this system, the Commission mandates certain indirect financial contributions to the creative sector through the CMF and other independent production funds. These various financial supports are key to cultivating a strong Canadian production sector. At the public hearing, eOne stressed the importance of Canadian control of the international distribution of the programming Canadians create, in part through the creation of larger, more stable and better capitalized Canadian production and distribution companies. It also put forward a proposal to review the points system used to determine the Canadian nature of certain high-profile, high-budget productions provided that the worldwide distribution rights are retained by a global content exporter who has demonstrated a track record of investing a significant amount into Canadian content programming. According to eOne, this could help retain the world-class Canadian talent currently working in the U.S. or elsewhere and incent them to create content in Canada that is attractive on an international level. Similarly, Ms. Berkowitz proposed bringing Canadians back from Hollywood and turning Canada’s proximity to the U.S. into a competitive advantage rather than disadvantage by changing the points system so that Canadians do not have to be residing in Canada. “Canadian-created stories,” in Berkowitz’s view, would recapture the value of Canadian expatriates working in Hollywood and make the “brain drain” into a “brain chain.” She proposed a new points system which can be found in her written submission. The Shaw Rocket Fund made a number of requests to revise aspects of the framework surrounding CIPFs in order to remove perceived barriers towards the maximization of their contribution to the funding and success of Canadian content. Bell offered a proposal for increased funding for big budget Canadian productions, defined as over $1.75 million per episode. This would redirect 0.5% of BDU contributions into a new fund and also require foreign online video services to contribute. For its part, Rogers argued that terms of trade are counter-productive to the creation of Canadian content. Broadcasters are restricted in how much money they can recoup from productions they help to finance. Rogers explained that broadcasters are reluctant to underwrite made-in-Canada innovative and creative concepts and ideas that are unproven, unless they are given some added incentive (e.g., extended licensing terms or increased revenue and profit-share opportunities). It urged the Commission to reconsider its views on the value, need and effectiveness of an industry terms of trade agreement and refrain from requiring broadcasters to adhere to one as a condition of licence. Section 3(1)(d)(ii) of the Act states that the broadcasting system should encourage the development of Canadian expression by providing a wide range of programming that reflects Canadian attitudes, opinions, ideas, values and artistic creativity, and by displaying Canadian talent in entertainment programming. In addition, section 3(1)(f) states that each broadcasting undertaking should make maximum use, and in no case less than predominant use, of Canadian creative and other resources in the creation and presentation of programming. Furthermore, the CBC, as Canada’s national public broadcaster, must provide programming that is predominantly and distinctively Canadian as set out section 3(1)(m)(i) of the Act. Canada has a stable infrastructure of government support and private investment that generates significant funding opportunities for Canadian programming. However, there are barriers in this infrastructure that hinder the creation of certain types of productions. The Commission considers that this funding system could be further improved in order to foster a robust Canadian production sector that is better able to offer compelling high-quality content to Canadians and to global markets. A more flexible funding system would further contribute to meeting the Act’s objectives set out above. both parties rely heavily on government subsidies and investment for sustainability. The Commission is of the view that this situation is indicative of poorly capitalized independent production companies. According to estimates published by the CMF, there are more than 900 Canadian television production companies. Many of these are very small or temporary in nature. They may be constituted to produce only a single program or even one season of a single program and are later dissolved. Even those companies that continue to carry on year over year are often small and operate with limited resources. Such poorly capitalized independent production companies tend to be dependent on government subsidies and funding from production funds for which allocation is controlled by licensed broadcasting services. Such an environment incents independent producers to behave like production contractors operating in a service industry, i.e., only producing on behalf of licensed broadcasting services but unable of exploiting their content and intellectual property. This project-by-project system hinders growth and does not support the long-term health of the industry as a whole. The Commission considers that the current situation is no longer tenable. The production industry must move towards building sustainable, better capitalized production companies capable of monetizing the exploitation of their content over a longer period, in partnership with broadcasting services that have incentives to invest in content promotion. In the Commission’s view, a robust Canadian production sector is necessary in order to exploit longer-term revenue opportunities of content (including international sales). Ideally, this would entail partnerships between well-capitalized independent production companies and broadcasters that own equity in the content and intellectual property. Such arrangements could result in higher-quality Canadian programming with more success both domestically and internationally. remove disincentives to the creation of online productions. the CMF and government remove the requirement for a producer to have a broadcast licence agreement with a traditional Canadian broadcaster in order to obtain funding for Canadian productions. With a view to achieving similar objectives with respect to its own rules and practices, the Commission will review its policies on CIPFs later this year to ensure that they allow greater flexibility in the funding of Canadian programs. In the same vein, the Commission considers that the future television environment may require new approaches to what constitutes Canadian programming. In the current system, programs are recognized as Canadian based on the various creative and other roles played by Canadians and Canadian companies in the production of a program. those that are co-ventures-in other words, co-productions involving production companies from countries with which Canada does not have a co-production treaty. These productions can benefit from production-services tax credits and can be counted by broadcasters towards the fulfilment of their Canadian programming obligations. Unlike a novel which may only have a single author, a television program is a collaborative effort, involving numerous individuals in a variety of creative roles such as screenwriter, lead performer, producer, director, and many more. The way to determine if a production can be certified as Canadian is to consider the citizenship of the people involved. This is done through what is known as a “points system.” Points are assigned based on the Canadians in key creative roles in order to determine if a production is certifiable as Canadian, and therefore, eligible to apply for funding and tax credits or be counted towards expenditure and exhibition requirements.Footnote 8 In this way, it is not the content of the production that counts as Canadian, but the citizenship of the creators. Productions are certified as Canadian by either the Commission or the Department of Canadian Heritage through the Canadian Audio-Visual Certification Office (CAVCO). CAVCO certification recognizes only treaty co-productions as Canadian, whereas the Commission also recognizes international co-ventures. In recent years, this flexibility has enabled large-scale productions such as “Beauty and the Beast” and “Reign.” Large pre-sales to foreign networks (generally U.S. networks) are the way in which some of these co-venture productions can be made. Pilot Project 1: As an exception to the standard Canadian program certification process, recognize live-action drama/comedy productions based on the adaptation of best-selling, Canadian-authored novels as Canadian. 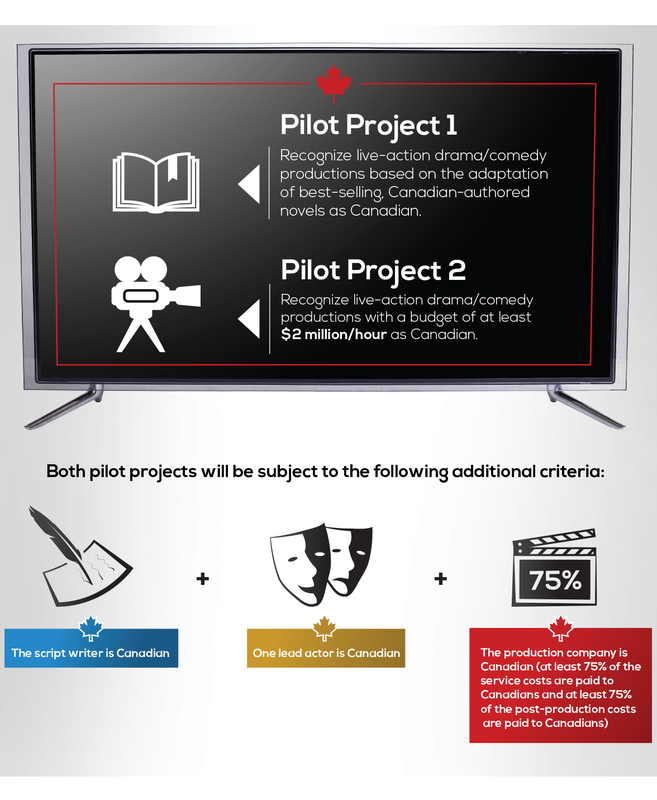 Pilot Project 2: As an exception to the standard Canadian program certification process, recognize live-action drama/comedy productions with a budget of at least $2 million/hour as Canadian. at least 75% of the post-production costs are paid to Canadians. For its part, the Commission will recognize productions that meet the requirements of these pilot projects as Canadian for the purposes of the regulatory requirements of television programming services, and certify such programs where appropriate. Co-ventures that meet the criteria above may also be considered eligible to participate in these pilot projects. The Commission is also open to considering other proposals for pilot projects. Such proposals would need to be consistent with the outcomes the Commission is seeking to achieve. However, the Commission recognizes that these pilot projects can only be successful with the participation and engagement of other partner groups and agencies, including CAVCO and the CMF. Accordingly, the Commission is committed to working in collaboration with these and other stakeholders to implement the pilot projects. The Commission will evaluate the success of the pilot projects once they have been running for a period of at least three years. Terms of trade emerged as a subject matter in the 2006 review of certain aspects of the regulatory framework for over-the-air television announced in Notice of Public Hearing 2006-5. Industry organizations in the English-language market asked the Commission to encourage the development of guidelines that would outline acceptable terms of trade similar to those found in the United Kingdom (U.K.) and overseen by the British communications regulatory authority Ofcom. Ofcom enforced collective terms of trade for television programming in a published Codes of Practice in 2004, which set a transparent basis for commissioning deals to mitigate the exercise of broadcasters’ negotiating power. In the U.K., terms of trade helped to stabilize and capitalize the independent production sector, facilitating its ability to compete globally, and to clarify digital rights. In Canada, the dispute between ACTRA and the Canadian Film and Television Production Association (CFTPA) (now called CMPA) in early 2007 became an example of the need to clarify such rights, so that the industry would not become destabilized: ACTRA was in a strike situation with the CFTPA because the actors wished to be compensated for their work when distributed online. The Commission set out its determinations of the 2006 review in Broadcasting Public Notice 2007-53. In that policy, the Commission determined that terms of trade agreements would provide stability and clarity to all concerned, and encouraged the development of such agreements between broadcasters and independent producers. It expected licensees to provide draft or signed terms of trade agreements with independent producers as part of their licence renewal applications. Subsequently, during the group-based licence renewals for the English-language television groups (see the introductory decision set out in Broadcasting Decision 2011-441), the Commission imposed, for each of Bell, Shaw, Corus and Rogers, a condition of licence requiring each licensee to adhere to a terms of trade agreement with the CMPA. As noted in Broadcasting Decision 2012-241, Astral concluded agreements with the APFTQ (now called AQPM) and CMPA. Both agreements were filed as part of its licence renewal, but adherence to them was not required as a condition of licence. In Broadcasting Decision 2012-242 pertaining to TVA Group’s licence renewals, the Commission concluded that the public record had not revealed the existence of specific problems in the negotiations between TVA Group and independent producers but expected negotiations to continue to reach an agreement. In 2013, the Commission imposed conditions of licence requiring that the CBC have a terms of trade agreement in place with each of the CMPA and APFTQ. In all those instances, the Commission did not stipulate what should be in the agreements, but rather only that such agreements should be in place. Much has changed in the television environment since 2006. In particular, digital rights and other rights issues have largely been clarified. Most licensees now have negotiated terms of trade agreements. These initial agreements provide broadcasters and producers with the baseline obligations they require to ensure that the content is widely available and properly monetized. Terms of trade agreements between producers and broadcasters from the large private English-language ownership groups have been in effect for nearly four years and the parties to these agreements have had the opportunity to evaluate the ways in which the current agreements have both succeeded and failed. In the Commission’s view, it is no longer necessary for the Commission to intervene in this relationship by requiring adherence to terms of trade agreements. The Commission considers that broadcasters and producers now have the clarity and experience they need to negotiate any future agreement among themselves. As such, the Commission will allow programming services to apply to remove requirements to adhere to a terms of trade agreement, effective 29 April 2016, five years after the original executed agreement was submitted to the Commission. Broadcasters are able to make more informed programming selections and scheduling decisions and will have new opportunities to effectively monetize advertising. The contents of programming packages as well as the programming itself are tailored to the needs and interests of Canadians. The Canadian broadcasting industry is on a more equal footing with the international and online video markets. In early 2014, Tom Pentefountas, Vice-Chairman, Broadcasting, carried out a fact-finding exercise on the possible use of set-top boxes for audience measurement. Subsequently, as part of the current proceeding, the Commission posed a number of questions relating to the possible implementation of a set-top box-based audience measurement system. In Broadcasting Notice of Consultation 2014-190, the Commission also invited parties to propose a concrete model for the establishment of such a system which would maintain the privacy of individual Canadians. The Commission stated that the privacy of individuals as well as matters related to viewer consent and the gathering and storage of personal information are paramount considerations in the establishment of such a system. The collection of set-top box data is an area in which vertically integrated companies may have an advantage to the extent that they share set-top box data received from their BDUs with the television programming services that they also own. Services with a high number of viewers or subscribers also have access to a large amount of useful and relevant data from existing audience measurement services such as Numeris (formerly BBM Canada) that are often not available to services with fewer subscribers or niche services. In the Working Document, the Commission proposed that the industry be required to form a working group to cooperatively develop a set-top box-based audience measurement system, which would include technical standards, privacy protections, governance structure and cost sharing. The working group would be required to report back to the Commission on its progress. In December 2014, the Commission sent a letter to broadcasters and BDUs requesting a status report on the progress that has been made on the development of such a system and whether a working group had been formed to examine this issue. In their responses, the broadcasters and BDUs, with the exception of SaskTel, indicated that, while they would be willing to participate in a working group, such a group has not yet been formed. SaskTel indicated that it has no plans to implement an audience measurement system or share viewership data from its customers’ set-top boxes with third parties. At the hearing and in the final submissions, the establishment of a set-top box-based audience measurement system was supported by Bell (provided that it is compensated for the use of its data); Rentrak Corporation (which suggested that a system could be up and running within 18 months if it has the data from the BDUs); and numerous other parties, among them: Anthem Media, AQPM, the Association of Canadian Advertisers and the Canadian Media Directors’ Council, CBC, CMPA, Cogeco, the Conseil provincial du secteur des communications (CPSC), Shaw, SaskTel, V Média, Hollywood Suite, the Independent Broadcast GroupFootnote 9 (IBG), Numeris, Ontario Ministry of Tourism, Culture and Sport, On Screen Manitoba, St. Andrews Community Channel, Stingray Digital Group and the U.S. Television Coalition. Quebecor, on behalf of Videotron, and Rogers which had initially opposed the proposal in written interventions, also later supported it. Other parties raised various concerns. MTS stated that set-top box data has little value on an aggregated, industry-wide basis, since the data would not be consistent from one BDU to another. One individual, Zachary Kornblum, considered that if the issue is asymmetry of information, parties should work with Numeris to set up a public fund for it in return for making its data public. SaskTel expressed concerns over the protection of its subscribers’ privacy. Along the same lines, the Office of the Privacy Commissioner of Canada (OPC) stated that the information collected by set-top boxes would likely be personal information and could be sensitive. It also stated that without more information about the nature and scale of the data that could be collected, who would be collecting the data and with whom it would be shared, it was difficult to fully evaluate the privacy impacts of the proposal. The OPC submitted that, to the extent that set-top box audience measurement involves the collection of personal information, it should only be done with the express consent of the individuals involved, when the information, alone or in combination with other information, is sensitive. The OPC proposed a number of privacy protections and further submitted that the types of personal information to be collected need to be identified. Similarly, the Public Interest Advocacy Centre, the Consumers’ Association of Canada, Council of Senior Citizens’ Organizations of British Columbia, the National Pensioners Federation, Option consommateurs and the Canadian Ethnocultural Council (collectively, PIAC et al) suggested that any data collection regime required informed and explicit opt-in consent. The Union des consommateurs was concerned that, since every set-top box is linked to a postal code, any collected info could be traced back to identify users, which could be in contravention of the Privacy Act. During the online consultation, a few individuals expressed concerns over the privacy of their viewing habits and indicated that they would drop their service if their household’s viewing data was collected. One individual was concerned that the “secret working group” would be held behind closed doors. This person expressed a desire to be part of this exercise in order to know what information would be collected by the BDUs. In its final comments, Pelmorex recommended an interim governance board instead of a working committee. It suggested that this interim board, not dissimilar in composition to that of the Numeris board, would be composed of key stakeholders to oversee the development of technical standards, privacy protections, cost sharing and the selection of the set-top box data aggregator and its integration with the existing Numeris audience measurement system. The Commission considers that a set-top box-based audience measurement system would contribute to the fulfilment of certain objectives set out in the Act, namely sections 3(1)(d) and 3(1)(s)(ii) which state that the broadcasting system should be readily adaptable to scientific and technological change and that private networks and programming services should be responsive to the evolving demands of the public. Viewer information will be essential in the emerging viewer-centric television environment. The Canadian television industry should have access to appropriate tools to effectively respond to changes in the industry and to the needs and interests of viewers, provided that the privacy of those viewers is protected. A set-top box-based audience measurement system could be such a tool as its data can be used to measure viewing levels of programs more accurately. Such a system would improve the industry’s ability to provide Canadian viewers with the programming they want to watch and the information they need to make informed choices. It could also serve to increase revenues flowing to program creators. The data collected would also benefit services with fewer subscribers or niche services that may not currently have access to meaningful audience measurement data, e.g. APTN, TVO, Knowledge Network. There is broad consensus within all sectors of the industry to participate in a working group to sort out issues related to the development of a set-top box-based audience measurement system. While Pelmorex provided a detailed strategy for implementing an alternative initiative, in the Commission’s view, it would be more appropriate to provide an industry working group with an opportunity to develop its own plan for moving forward. The Commission considers that the industry should be provided with the opportunity to make key decisions on essential areas, such as governance, on a collective and cooperative basis rather than being subject to an imposed solution. Any set-top box-based audience measurement system would be developed by and for the benefit of the broadcasting industry. Pelmorex would have the opportunity to present its proposals to the working group. However, any solution proposed by the industry must maintain the privacy of Canadians. ensure that the privacy of individuals is protected. Accordingly, the Commission requires the industry to form a working group, which will begin meeting by no later than 13 April 2015. This working group will cooperatively develop a set-top box-based audience measurement system, which will include technical standards, privacy protections, governance structure and cost sharing. It will also examine how the audience measurement system or a similar system could best be applied to viewing. This group is to report to the Commission on its progress by no later than 10 June 2015. The working group will report back to the Commission on its conclusions regarding the data to be collected, a governance structure, privacy protocols (including whether aggregation of data addresses all privacy issues), and a system for addressing the funding and cost recovery. If, when the working group reports to the Commission, the Commission does not see adequate progress being made or that the policy objectives of the Act or principles set out in paragraph 158 are not appropriately addressed, it may choose to intervene with specific guidance in order to advance the establishment of this system. Canadians have access to quality original Canadian programming in their chosen viewing environment. In Broadcasting Notice of Consultation 2014-190, the Commission stated that as the relationship between Canadians and the licensed system changes, existing supports for Canadian programming will be affected. It further stated that shifting viewer behaviour, whereby viewers increasingly seek out and choose to consume programming on a program-by-program basis rather than through linear channels, will also have a significant impact on the funding model. The Commission therefore found it timely to review the various supports for Canadian programming that fall under the Commission’s purview. To ensure the presence of compelling Canadian programs on multiple platforms in the future, the Commission announced that it would be prepared to consider various incentives and measures such as reducing or eliminating exhibition requirements for Canadian programs other than local programming and imposing CPE requirements on all licensed television stations and specialty and pay services. maintain the group-based licensing approach and adjust CPE levels initially to maintain the current level of dollar expenditures. Increase CPE over the licence term. CPE levels will be determined at licence renewal. the view that it should compete with American programming without any regulatory support. In this section, the Commission introduces measures which recognize that, while significant changes are occurring in the viewing habits of Canadians and in the delivery of content, the break with the past is not complete. Emerging practices exist side by side with traditional ones, and supports for Canadian programming must be adapted in response to this state of flux. In Broadcasting Regulatory Policy 2010-167, the policy setting out the Commission’s approach to group-based licensing (the group-based licensing policy), the Commission announced that it was reducing the minimum obligation for all conventional television stations to the broadcast of Canadian programs from 60% to 55% over the broadcast year, while maintaining existing levels for the evening viewing period of 6 p.m. to midnight. The Television Broadcasting Regulations, 1987 were then amended to reflect this new level. Category A service obligations are set by condition of licence and vary according to the nature of the service. In most cases, these obligations require that a minimum of 50% of the programming broadcast over both the broadcast day and evening broadcast period be Canadian programming. In the group-based licensing policy, the Commission confirmed that the obligations of specialty services would continue to be tailored to reflect the character of each service. All English- and French-language Category B services have the same exhibition requirements. These requirements ramp up over the first three years of operation and by the third year of operation, they must devote 35% of the day and 35% of the evening to the broadcast of Canadian programming. For third-language and ethnic services, the exhibition requirement is 15%. Category C national news services must devote no less than 90% of the broadcast day to the broadcast of Canadian programming. Mainstream sports services must devote no less than 60% of the broadcast day and no less than 50% of the evening broadcast period to the broadcast of Canadian programming. be allowed the flexibility to allocate CPE between their various services, with only a maximum of 25% of the required CPE for conventional television stations to be attributed to other qualified specialty services within the group. The Commission’s objective was to stabilize contributions to the creation of English-language Canadian programming and permit groups to adapt quickly to a changing environment through CPE flexibility. In the French-language market, the circumstances of the two principal private television groups stand in stark contrast to one another. In TVA Group’s case, there has been a general recognition that TVA makes a significant contribution to Canadian programming, one that far surpasses those imposed in the English-language market. V Média, in contrast, has no CPE obligations, given that, among other things, at the time of its last licence renewal, such obligations were not typically imposed on services. Outside of the large ownership groups, CPE is imposed on a case-by-case basis in both the English- and French-language markets. With few exceptions, all Category A services and Category C sports services have a CPE requirement, while Category B services generally do not. Although most parties noted the need to focus on the quality of Canadian programming rather than the quantity, opinions diverged greatly with respect to reducing or eliminating exhibition requirements. Bell proposed harmonizing the requirement at 50% for local conventional stations and 35% for specialty services and having no requirement for the evening period. The latter proposal was elaborated in an undertaking concerning specific conditions of licence that “cause” the recycling of Canadian programs across services. Corus advocated eliminating all exhibition requirements. Shaw proposed 50% during the evening broadcast period and 25% during the broadcast day for all services. Parties principally from the creative sector either opposed decreases in exhibition (Directors Guild) or expressed concerns (ACTRA). The Writers Guild stated that it was not in favour of an expenditures-only approach. It argued that such an approach could result in fewer shows but with bigger budgets, which would result in a shrinking talent pool in Canada. Much like the creative sector, PIAC et al did not consider it necessary to change current regulatory supports for English-language Canadian programming. The Forum for Research and Policy in Communications, on the other hand, proposed that conventional television stations should be permitted to gradually reduce the level of Canadian content exhibited from the current 55% to 35% by 2025. It also recommended that the Commission replace its current 55% requirement for Canadian content on private television stations with a 35% Canadian drama requirement from 8 p.m. to 11 p.m. each broadcast week. The Ontario Ministry of Tourism, Culture and Sports stated that regulatory asymmetry should not be decreased by lightening television regulation. It considered that maintaining the current level of television regulation is essential to the health of the Ontario industry and the Canadian broadcasting system. Certain third-language ethnic services proposed the imposition of a CPE requirement to replace their exhibition requirement. In the French-language market, AQPM proposed to reduce by 20% the current exhibition levels during the broadcast day and to reduce by 10% the evening broadcast period. In addition, AQPM proposed a 10% increase to the current CPE obligations. All of these changes would be implemented at licence renewal. V Média supported the elimination of exhibition requirements but only during the broadcast day, while the Alliance des producteurs francophones du Canada (APFC) opposed it and expressed concern over a possible reduction in the production of certain genres of programming, e.g., magazines, game shows, talk shows as well as youth and children’s programming. The Union des consommateurs also opposed this proposal. ARRQ, UDA and SARTEC argued for case-by-case conditions of licence to address the decline in original French-language programming. For its part, Quebecor maintained that regulations like this are not necessary in the Quebec television market. The Commission has used exhibition requirements as one of the means of achieving the Act’s objectives set out in section 3(1)(e) and (f). It is apparent however, that while content quotas of this type may have been useful in ensuring the presentation of Canadian programming in a fully linear television system, they will be a less and less effective tool in an increasingly on-demand environment. Moreover, quotas can also have unintended detrimental effects. Specifically, data from program logs submitted to the Commission shows that on average well over 50% of Canadian programming broadcast on all services in both English- and French-language markets is repeated on the same service or “recycled” from other services. Often a particular episode of a program is repeated numerous times over the course of a day, week, month and even over a period of many years. For some services, these amounts are far higher and more than 90% of Canadian programming is repeat or recycled programming. While this may be a viable business model for some services, the Commission is of the view that original first-run Canadian productions add more value to the system; the excessive repetition and recycling of programming appears to do little to achieve the objectives of the Act. For at least the short term, however, certain exhibition requirements may be effective in helping to achieve the objectives of the Act cited above. Data from Numeris for the 2013-2014 broadcast year and covering both linguistic markets shows that there is about five times more viewing to conventional television stations between 8 p.m. and 10 p.m., Monday to Friday, than at any hour during the rest of the day outside the evening broadcast period, and two to four times more viewing from 6 p.m. to 8 p.m. and 10 p.m. to 11 p.m. Thus, this evening prime time period is still when most viewers are watching conventional television stations. It is for this reason that the most attractive Canadian and non-Canadian programs are also broadcast in this period. Discretionary services (specialty and pay services) do not rely on simultaneous substitution, and often operate on a programming wheel nationwide, regardless of viewers’ time zone. Numeris data for the 2013-2014 broadcast year covering both linguistic markets demonstrate that the peak evening period is considerably less significant for discretionary services than it is for conventional stations. At the same time, discretionary services offer far greater levels of repeat and recycled programming than conventional services and often repeat the same programs over the course of each broadcast day. Therefore, the current evening broadcast period exhibition requirements for discretionary services do not appear to contribute in any significant way to the achievement of the objectives of the Act. With respect to overall broadcast day requirements for discretionary services, in light of the Commission’s determinations with respect to genre and standardization of licence classes set out later in this regulatory policy, the Commission considers a standardized approach to these requirements for all discretionary services appropriate. Further, given the Commission’s determination set out below to apply CPE requirements to all of these services, at the next licence renewal of each service, the Commission will set overall daily exhibition requirements for discretionary services at a standard level of 35%, which is the current requirement for Category B services that have been in operation for at least three years. The Commission recognizes that there may be services which will require a more individual approach to exhibition requirements. As an example, peak viewing periods are different for children’s and youth programming. These particular circumstances will be considered at licence renewal on a case-by-case basis as required. As noted above, reductions in exhibition requirements will be implemented through conditions of licence at the next licence renewal for each service and will take place in conjunction with the changes to CPE requirements set out below. For the services owned by the English- and French-language large private ownership groups, this will take place at licence renewal, by 31 August 2017. For the independent services, this could take effect as early as 1 September 2018, depending on their licence expiry dates. Parties were broadly of the view that an emphasis on the creation of Canadian programming through expenditures rather than exhibition requirements is the right approach. In this regard, many noted the need to focus on the quality of Canadian programming produced rather than the quantity broadcast. In the English-language market, most parties supported the proposal of a CPE requirement for all licensed services except the CBC and Knowledge Network, given their funding models as public broadcasters. Alternatively, Rogers and the Coalition of Small Market Independent Television Stations (SMITS) advocated for no CPE requirements for conventional stations in favour of local programming requirements. Parties from the creative sector, such as ACTRA and Onscreen Manitoba, supported increasing CPE. But, as noted earlier, the Writers Guild was not in favour of an expenditures-only approach that would eliminate exhibition requirements. The CMPA submitted that, going forward, it is critical to ensure broadcasters spend on original independently-produced content rather than simply on library material or in-house productions. It considered that the Commission should establish rules to ensure consumers in a pick-and-pay world would still get to watch new, original programs and require broadcasters to maintain the percentage of their CPE they have historically spent on new, original Canadian programs. Shaw argued that the timing was not right for an increase in CPE requirements and preferred to wait and see what came of the Commission’s other proposals, given their potential impact on revenues. Most parties viewed a standardized CPE approach for large ownership groups and their services as an appropriate approach, but indicated that a case-by-case approach would be better for the independent services and the French-language market. Some, such as Anthem Media, proposed that only those discretionary services reaching a certain number of subscribers should have a minimum CPE requirement. Large ownership groups with over $100 million in annual revenues would continue to be regulated on a group basis: CPE would be set at 25% of the previous year’s gross revenues to be shared between all services in the group, other than Category C national news and mainstream sports services. For services under the $100 million threshold, it recommended that the Commission take a case-by-case approach to determine appropriate CPE and Canadian exhibition levels. As in the English-language market, creative groups in the French-language market generally supported the Commission’s proposal to impose CPE requirements on all licensed television stations and specialty and pay services. Additionally, APFC, AQPM, UDA, SARTEC, Bell, CBC and Corus all submitted that CPE requirements should be linked to access rights and/or exhibition. Bell proposed an increased CPE requirement from 32% to 35% for French-language discretionary services, as long as genre protection and carriage rights are maintained, since that market is not as affected by online video services. APFC proposed that conventional television stations and pay and specialty services have a CPE requirement based on the total gross revenues from broadcasting revenues generated during the previous broadcast year. The ministère de la Culture, des Communications et de la Condition féminine du Québec (MCCCFQ) proposed no increase to the CPE requirement, while Quebecor maintained that regulatory requirements like this were not necessary in the French-language market. Festival Portuguese Television (FPTV) submitted that, in order to be an effective cultural bridge to new Canadians, third-language services must offer Canadian local programming that is relevant to the ethnic community that it is serving. In most cases, this involves the production of local programming-local being where the ethnic communities are located throughout Canada. FPTV stated that a minimum CPE requirement should ensure that the Canadian programming produced will be relevant to the service’s audience. Canadians have been clear throughout the Let’s Talk TV proceeding that they expect content of high quality from their television system. The creation of compelling high-quality productions by Canadians requires, among other things, financial investment. Investment in content of high quality that is widely available and well-promoted drives viewing and thereby generates revenues. These revenues can then be reinvested in producing future content. In the Commission’s view, CPE requirements provide necessary incentives to create such virtuous cycles of production. Moreover, such requirements are important tools to fulfil the objectives of the Act cited above, particularly in light of the determinations above relating to exhibition. In particular, applying CPE requirements to all licensed programming services will ensure that these elements of the television broadcasting system contribute in an appropriate manner to the creation and presentation of Canadian programming. Similarly, setting such requirements at appropriate levels will ensure that maximum and predominant use is made of Canadian resources to originate programming of high standard. The Commission further considers that such an approach will broaden the CPE base from which investments in Canadian programming can be made. Coupled with the additional scheduling flexibility provided by reduced exhibition requirements, the overall emphasis is placed on the quality of programs produced by Canadians, regardless of where or when programs are made available to Canadians. This overall approach also takes into account the possible impacts of other changes to be implemented in the present regulatory policy and other related determinations in the Let’s Talk TV proceeding by stabilizing the CPE base for Canadian production. In doing so, it recognizes that not all current Canadian programming services will be successful in the new television environment of the future. In light of the above, in the English-language market (including third-language services), the Commission will apply CPE requirements to all licensed services. Services that do not currently have a CPE requirement will be assigned one at licence renewal. The CPE levels will be based on historical expenditure levels. Further, for the large private ownership groups currently operating under the group-based policy, the Commission will maintain the group-based licensing approach and existing expenditure levels. The programming services that are part of a group will have CPE requirements that contribute appropriately to that group’s overall CPE level. For those groups operating French- and English-language services, each language group will be treated separately and may have distinct requirements. In light of the various other changes that the Commission is making in the Let’s Talk TV proceeding, the Commission is not proposing to raise CPE levels. Maintaining the status quo will give the Commission the opportunity to monitor the impact on revenues of the other changes originating from this proceeding and will allow affected parties to adapt accordingly. Since independent over-the-air stations will have a CPE requirement for the first time, the appropriate level of CPE will be set at the time of licence renewal, based on historical levels of expenditure. It will take into account any relevant outcomes of the proceeding reviewing local and community programming as announced in Broadcasting Regulatory Policy 2015-24. With respect to English- and third-language discretionary services, CPE requirements will be implemented for all services with over 200,000 subscribers. As discussed later in this document, all discretionary services under 200,000 subscribers will be exempt from licensing under a new exemption order. CPE for licensed services will be established in a case-by-case manner and based on historical levels. However, given the great variation in the revenues and expenditures of discretionary services and the fact that certain services make little or no expenditures on Canadian programming, the minimum level of CPE applied will be 10%. In the Commission’s view, this level represents an attainable floor for any discretionary services that still ensures some contribution to the creation and presentation of Canadian programming. Currently, 19 services have CPE of less than 10%, with an average of 5%. TVA Group currently operates under an exception allowing it to calculate its CPE based on total programming expenditures rather than revenues. V Média currently has no obligation and a much smaller revenue base than TVA Group. RNC and Télé-Inter-Rives only operate affiliate stations of the other networks, making CPE irrelevant. Accordingly, in the French-language market, the Commission will encourage commonly owned services to apply as groups at licence renewal. The Commission will establish with these services the level at which they should contribute financially towards Canadian programming on a case-by-case basis. With respect to French-language discretionary services, the Commission will implement CPE requirements for all services with over 200,000 subscribers. The requirements will be established on a case-by-case basis and will be based on historical expenditure levels. The requirements, if any, remain unchanged for the CBC, provincial educational services, licensed over-the-air community television stations, as well as national news and mainstream sports services. The Commission is concerned that by shifting the focus away from the exhibition of Canadian content towards the production of even higher quality Canadian programming through expenditures, there may be a negative impact on time credits for programs dubbed in Canada. This impact would be most felt in the French-language market, where dubbing is more prevalent. Dubbing programs in Canada provides Canadian viewers with a higher quality experience of dubbed programming. That is because the version dubbed in Canada is better able to take into account the specific linguistic and cultural context of the Canadian viewer, making use of familiar expressions and accents. The Commission seeks to ensure that Canadian television services continue to make maximum use of Canadian dubbing services in the creation and presentation of programming to Canadians, in accordance with section 3(1)(f) of the Act. increase the number of exchanges between the country’s two linguistic markets and bring them closer together (i.e., an English- or French-language program, once dubbed in the other language, can be rebroadcast in another market, find a new audience and gain visibility nationally and internationally). Dubbing provides Francophones with a window into the English-language programming produced in Canada, in addition to programs produced internationally; and conversely, it provides Anglophones with access to French-language programming produced in Canada and abroad. In order to ensure that Canadian television services continue to use Canadian dubbing companies, the Commission considers it appropriate to raise the additional time credit awarded for Canadian and foreign programs dubbed in Canada to 33%. All other applicable conditions put forward in Public Notice 2000-42 and Broadcasting Regulatory Policy 2010-905 remain the same. The Commission is confident that this measure will allow Canadian television services to continue to make maximum use of Canadian dubbing services in the creation and presentation of programming to Canadians, in accordance with section 3(1)(f) of the Act. In the Commission’s view, the broadcasting system should rely on market forces to the extent that the market can provide programs and services that achieve the objectives of the Act. Only when the market fails to provide such services or programming will the Commission intervene. Regulatory barriers to entry, programming adaptation and domestic competition are removed and program diversity is generally governed by market forces to the extent possible. Programmers are able to respond to consumers and adopt creative programming strategies. The genre exclusivity policy is a key component of the current regulatory framework for the television system. Under this policy, select specialty and pay services, referred to as Category A services, are licensed on a one-per-genre basis. These Category A services are licensed to provide programming of a specific type from specific program categories or relating to certain subjects. The genres are intended to be defined in such a way that the Category A services are complementary and do not compete head-to-head with one another. These include, for example, a history service, a premium movie service and a travel service. Category B services, on the other hand, may compete against each other. However, the Commission does not generally authorize Category B services that would directly compete with an existing Category A service. Category C services operating in the genres of national news and mainstream sports may compete against other services in the genre, but not with Category A services. To ensure that a discretionary service remains distinct and adheres to the genre in which it was licensed to operate, the Commission imposes conditions of licence that define and limit the programs it can provide. These conditions of licence are collectively called its nature of service. The Commission’s objectives with respect to its genre policy have been two-fold: to ensure a diversity of programming genres and to provide a measure of support to pay and specialty Category A services to enable them to meet their Canadian content and other programming obligations, which are generally higher than those for other types of specialty and pay services. The nature of service also informs subscribers about the types of programming that they can expect to receive. Although related in a number of ways, the genre exclusivity policy is separate from the access rules relating to the distribution of services by BDUs and is not addressed in the present policy. The access rules will be addressed in the Commission’s determinations concerning consumer choice and flexibility, which will be published in the coming weeks. In Broadcasting Notice of Consultation 2014-190, the Commission sought comments on whether there is an ongoing public interest purpose served by maintaining regulated genre protection for pay and specialty services. In the Working Document, the Commission proposed to eliminate the genre exclusivity policy and protections for Category A services. Under this proposal, Category A services would no longer have a regulated nature of service, but would be fully competitive with other discretionary services and subject to standard requirements. BDUs as well as programming services owned or controlled by vertically integrated companies generally supported eliminating genre protection. They argued that removing genre protection would allow services to better respond to evolving consumer demands, encourage innovation, and improve the quality of programming. They also argued that it would simplify the licensing approach and lessen regulatory burden, and that the market is sufficiently mature to permit open competition, given the existence of many popular and successful brands. Many vertically integrated companies noted that the lines are already significantly blurred. Independent programmers, some of the groups representing the official language minority communities (OLMCs) and creative groups generally opposed removing genre protection, primarily due to its connection to access rules for mandatory distribution of Category A services by BDUs. However, they also argued that it is an important mechanism for retaining programming diversity. Many suggested that without genre protection, there may be a “rush to the middle” and increased competition for highly popular or lower cost (largely U.S. reality) programming. Several expressed concern that without genre protection, programming services owned or controlled by vertically integrated companies could occupy all the most attractive genres. The creative groups further expressed concern that the removal of genre protection would be accompanied by applications for reduced commitments to Canadian programming. Some parties, such as Bell, Corus, APFC, AQPM and MCCCFQ, stated that genre protection should be retained in the French-language market. Some were concerned that its smaller size makes it more vulnerable to increased competition in popular genres and to Videotron’s dominance in the distribution market. Others were concerned that certain discretionary services could become unprofitable and that the quality of the programming would be affected as a result. Only Quebecor supported the removal of genre protection in that market. IBG stated that genre protection is essential for independent services, noting that the services that have strayed furthest from their nature of service appear to be services owned or controlled by vertically integrated companies. IBG recommended that it be maintained until the Commission renews the licences of independent services in 2018, when the Commission would be in a better position to evaluate the impact of the changes it is now considering. However, these parties focused primarily on access rights rather than genre. Pelmorex alone suggested genre protection was more important than access. The CBC stated that the elimination of genre protection would permit vertically integrated companies to introduce their own competitive services in the most attractive genres and squeeze out the independent services in those genres. In its view, this would lead to less diversity in the system. It recommended the Commission revisit this issue in three years. Several parties recommended that genre protection (and access rules) be phased out only at licence renewal. Bell proposed that genre protection be phased out as of December 2015 to give time to services to adjust. The Commission considers that genre protection has ceased to be an effective tool for ensuring programming diversity. Rather, it has become a regulatory burden that stands in the way of programming innovation. It also has the indirect effect of protecting from competition established brands and services, services which are primarily owned by vertically integrated companies. In fact, as a result of consolidation over the last few years, most of the 65 Category A services have been purchased by the large private ownership groups: only 15 are considered independent services. While independent services have expressed concern that vertically integrated companies will launch competitive services and effectively preclude the independent services’ continued existence or entry into the system, the Commission notes that most independent services already operate in more niche genres that are likely not prime targets for competition. Nor has genre protection regulation prevented the lines between services from being blurred or from services “rushing to the middle” and concentrating on similar types of programming: many services have strayed, either willingly or inadvertently, outside their nature of service and large private ownership groups that own several programming services commonly move programming from one service to another in a completely different genre as well as broadcasting the same or similar shows on multiple services each operating in a distinct genre. Further, the Commission is of the view that the policy has also had unintended negative consequences, such as conditions of licence that are complicated and difficult to enforce given the subjective nature of genre. In addition, the exclusive nature of genre protection has meant that new entrants have limited opportunities to operate in highly coveted niche genres, even where that genre may have been abandoned by the service licensed to serve in that genre. Some of the current genres used by Category A services were defined as far back as 1984, while the most recent ones were established in 2001. While those genres and the genre protection policy may have been successful in the past, the needs and interests of Canadians, the availability of content, as well as production and distribution technology have all changed in radical ways in the last decades. In the Commission’s view, continuing to enshrine the policies and cultural norms of decades past in a forward-looking policy for the new television environment would make little sense. The Commission acknowledges that these challenges are significantly less pronounced in the French-language market. While they do operate in a smaller market, French-language services have strong brands, and will likely find it easier to distinguish themselves from each other. In addition, no intervener provided tangible evidence to suggest that the services would significantly modify their programming strategies in a way that would substantially harm the diversity of programming available to Canadians. The Commission is of the view that the elimination of genre protection will grant greater flexibility to broadcasters to create and acquire programming which they consider will best suit their audiences. Existing services and new entrants will now have the ability to adapt their programming strategies and shift their services into genres that may be more attractive and popular to Canadians and to develop new, innovative types and genres of programming without the need to meet or avoid genres proscribed by regulation. These services will be enabled to respond to the evolving demands of the public and thus help to fulfil the objective set out in section 3(1)(s)(ii) of the Act. Further, the Commission considers that the Act’s objective set out in section 3(1)(i)(i) that the programming be varied and comprehensive, that it provide a balance of information, enlightenment and entertainment for men, women and children of all ages, interests and tastes, can be met by these services without this type of regulatory intervention. The Commission acknowledges the concerns expressed by various parties. However, it is of the view that the market will ensure programming diversity, especially in a system characterized by maximum choice and flexibility for consumers. In such an environment, services must necessarily differentiate themselves from others and provide programming of interest to Canadians in order to maintain or grow their audiences. Branding, marketing, promotion and investment in quality service-defining programming will be key. Given the challenges the genre protection policy has faced in recent years, there is no evidence that maintaining genre protection would serve to ensure programming diversity in the future. In addition, removal of genre protection will reduce administrative burden as licensees will no longer need to apply for amendments for changes relating to the nature of their services or respond to complaints about possible violations of nature of service definitions. As an exception to the general elimination of genre protections, the Commission will retain the conditions of licence relating to nature of service for those services that benefit from a mandatory distribution order under section 9(1)(h) of the Act, including national news services, which are discussed in more detail below. These services receive mandatory distribution due to the importance of the programming these services offer to the achievement of the objectives of the Act. The Commission will also retain limitations with respect to mainstream sports services. Licensees that choose to operate mainstream sports services are required to meet, among other things, high CPE requirements of 50% of each year’s gross broadcast-related revenues. Other discretionary services that wish to offer some sports programming are limited to a maximum of 10% live professional sports programming in each broadcast month, unless they choose to undertake the greater CPE and other requirements of mainstream sports services. The Commission will therefore retain the current 10% limit on live professional sports programs for discretionary services other than mainstream sports services. This will ensure that other services do not morph into mainstream sports services without the same expenditure and exhibition requirements. Accordingly, the Commission will eliminate the genre exclusivity policy and related protections for all English- and French-language discretionary services. New or existing services that wish to offer programming from formerly protected genres may do so immediately. The Commission will no longer enforce conditions of licence relating to nature of service, aside from those exceptions noted above. Existing discretionary services, other than those benefitting from a 9(1)(h) order, may apply to delete conditions of licence relating to their nature of service immediately, with the exception of those conditions related to maximum amounts of sports programming. However, to ensure that both Canadians and the Commission continue to have basic information about the discretionary services in operation, deleted conditions of licence relating to their nature of service will be replaced with requirements to provide the Commission with the name and a brief description of the service and to update this name and description any time it changes. This description and the name of the service will be listed on the Commission’s website and noted in any decision approving a new service or renewing a licence. For greater clarity, a change to the name of the service will not alter the name of the licensee of the service in the Commission’s records, nor will the Commission require that the service adhere to the description of the service as a condition of licence. Further, the Commission has amended the exemption order relating to discretionary services serving fewer than 200,000 subscribers, discussed in more detail in a later section, to remove the obligation for an exempt service to declare a nature of service definition to which the service will adhere. This exemption order is set out in Broadcasting Order 2015-88, also issued today. The Commission will also amend the standard conditions of licence for VOD services set out in Broadcasting Regulatory Policy 2014-444 in order to remove the prohibition against a Canadian subscription VOD package from competing directly with a genre-protected Canadian discretionary service. Canadians have access to high quality news information and are exposed to news and information from a diversity of views on matters of public concern. In Broadcasting Public Notice 2008-100, the Commission stated that programming services operating in the genre of national news, such as CBC News Network, CTV News Channel, Le Canal Nouvelles (LCN) and Le Réseau de l’information (RDI), were strong, healthy, highly popular and highly competitive. The Commission therefore determined that it would be appropriate to introduce competition between Canadian services operating in this genre. The Commission set out standard conditions of licence for national news services in Broadcasting Regulatory Policy 2009-562-2. These services benefit from a mandatory distribution order under section 9(1)(h) of the Act (Broadcasting Order 2013-735). In Broadcasting Regulatory Policy 2013-734, the Commission set out a number of safeguards to ensure greater and more equitable access for Canadians to national news services, including the requirement that BDUs make these services available to their subscribers. The Commission stated in that regulatory policy that the licensing requirements for these services needed to be revised in light of their privileged distribution rights and to also ensure that Canadians receive high-quality news programming. a commitment that programming be drawn exclusively from news and current affairs programming. the proposed service would bring additional programming diversity to the national news landscape. Many Canadians who participated in the consultation during Phase 1 of the Let’s Talk TV proceeding stated that they are concerned about news and information. This view was also reflected in the answers Canadians provided in a public opinion research survey conducted by Harris/Decima.Footnote 13 According to the findings, news programming is the most important type of television programming to Canadians, whether local (81% saying it is important), national (78%), documentaries (72%) or international (68%). Broadcasters generally supported the proposal for national news services set out in the Working Document. Some, however raised issues relating to the original programming and to the program categories from which such services may draw programming. Bell and Quebecor, among others stated that if the Commission were to impose an obligation of 16 hours per day of original programming, this programming should not be restricted to “first-run/live news programming” in order to permit it to count repeat broadcasts. They argued that it would be very difficult for any national news service to meet a requirement of 16 hours per day of original, first-run news programming. If the obligation were to be defined as first-run/live programming, Bell suggested a lower limit such as 12 hours per day and Quebecor proposed a limit of 13 hours per day, Monday to Friday, with no requirement for weekends. With respect to the type of programming that these services should be allowed to broadcast, a few broadcasters submitted that the programming should be drawn from the following program categories set out in Item 6 of Schedule I to the Specialty Services Regulations, 1990: 1 News, 2(a) Analysis and interpretation, 2(b) Long-form documentary and 3 Reporting and actualities. Cogeco was the only BDU to comment on this issue. It did not support the proposal from the Working Document and argued that, given the Commission’s proposed approach regarding flexible packaging, the removal of genre protection for specialty services, and more programming choice from non-Canadian sources, there is no justifiable need to establish and maintain a separate licensing category for these services. The CPSC viewed the proposed criteria as a step in the right direction. However, it added that more needs to be done not only to ensure high-quality news programming, but to prevent too much air time from being dedicated to opinion-based information and commentary instead of factual-based information. CPSC argued that the current Journalistic Independence Code administered by the Canadian Broadcast Standards Council (CBSC) is not detailed enough to ensure high-quality programming and does not provide defined guidelines regarding opinion-based programming, and suggested instead a proper code of ethics resembling the Conseil de presse du Québec’s Rights and Responsibilities of the Press, which includes information regarding the distinction between different journalistic formats, conflicts of interest and integrity in the presentation and illustration of news. Quebecor requested that the Commission amend the standard condition of licence limiting national news services to a maximum of 12 minutes of advertising per hour. It proposed that the minutes be averaged over the day rather than being counted in each hour. It argued that this amendment would provide added flexibility during the continuous news coverage of a special event. National news services play a vital role in achieving the objectives of the Act by helping Canadians participate fully in the democratic, economic, social and cultural life of their country, their regions, their provinces and their neighbourhoods. These services also contribute to meeting the objective set out in section 3(1)(d)(ii) of the Act that the broadcasting system should offer information and analysis concerning Canada and other countries from a Canadian point of view. As well, these services help to fulfil the objective set out in section 3(1)(i)(ii) that the programming be drawn from local, regional, national and international sources. The level of regulatory intervention required by the Commission is therefore commensurate with the importance placed on the role of these services. In Broadcasting Regulatory Policy 2013-734, the Commission stated that it considers that more stringent requirements are needed to ensure that national news services provide high-quality news programming to Canadians and that Canadians are exposed to a diversity of views on matters of public concern, particularly since these services benefit from mandatory distribution and other favourable terms of distribution as set out in Broadcasting Order 2013-735. In this regard, the Commission has taken into consideration the many proposals and comments put forward by interveners during the Let’s Talk TV proceeding. Specifically, the Commission considers that the national nature of these services must be better reflected in the criteria used to license these services. These services have a duty to reflect and report on all regions of Canada. They must therefore have the demonstrated capacity to gather news and report on events happening throughout the country. This could be achieved in a number of ways including arrangements between services. The standard conditions of licence and licensing criteria will be amended accordingly. In addition, as set out in the current standard conditions of licence, national news services may draw programming from all program categories. The Commission will restrict this condition of licence so that nearly all of the programming is drawn from program categories that are relevant to news services: (1) News, (2)(a) Analysis and interpretation, (2)(b) Long-form documentary and (3) Reporting and actualities. This amendment will ensure that a predominance of the programming broadcast relates to news while still allowing some programming flexibility. The licensee must broadcast 16 hours per day of original programming, 7 days a week, averaged over the broadcast year. This original programming need not be first-run. Not less than 95% of all programming broadcast during the broadcast month must be drawn from program categories: (1) News, (2)(a) Analysis and interpretation, (2)(b) Long-form documentary and (3) Reporting and actualities. The licensee must operate a live broadcast facility and maintain news bureaus in at least three regions other than that of the live broadcast facility (i.e., that it has demonstrable news gathering capabilities in several regions). The licensee must have the ability to report on international events from a Canadian perspective. In its intervention, Quebecor proposed that the condition of licence relating to advertising be amended in order to grant national news services the flexibility to offer continuous news coverage during a special event. The Commission considers that this added flexibility would not only ensure that viewers are kept informed of breaking news events, without interruption, but would also allow the services to respect their commitments to advertisers and not lose viewership to competitors. The Commission will therefore amend the standard condition of licence relating to advertising to allow licensees to count the maximum 12 minutes of advertising allowed per hour as an average over the broadcast day. For existing services, the new criteria above will be applied at the time of licence renewal and will be used to determine whether the service will continue to benefit from mandatory distribution as a national news service. The criteria will also be used in the assessment of applications for a broadcasting licence to operate a new national news service. Applicants will further need to provide evidence of demand for a new national news service and demonstrate that the proposed service will add programming diversity to the system. The Commission will publish these amendments to the standard conditions of licence for national news services in a future regulatory policy. The Commission will modify the mandatory distribution order for national news services to include new services as necessary. Canadians continue to have access to programs that make an important contribution to the broadcasting system. The Commission has better tools to monitor the production and exhibition of Canadian children’s and youth programming so as to determine whether regulatory intervention is needed. The objectives set out in the Act declare that the programming provided by the Canadian broadcasting system should be varied, comprehensive and encourage the development of Canadian expression by providing programming that reflects Canadian values and attitudes. The objectives also declare that the programming should include a significant contribution from the Canadian independent production sector. To ensure the fulfilment of these objectives, the Commission has encouraged the production of certain types of programs-drama, long-form documentary, music/variety and award shows-generally through expenditure requirements. These are called programs of national interest (PNI). Current PNI requirements were introduced only recently during the last licence renewal process for the large private ownership groups. These requirements include a minimum expenditure requirement on PNI as well as a set minimum allocation of PNI expenditures to programs made by independent producers. Among French-language services, only the discretionary services that were part of the Astral-designated group in 2012 are currently subject to a PNI expenditure requirement. In Broadcasting Notice of Consultation 2014-190, the Commission asked whether it should continue to encourage the production of certain types of programs and which types of programs should be supported. In the Working Document, the Commission proposed to maintain the current requirements for PNI in both the English- and French-language markets. In the French-language market, these would be re-examined at licence renewal. A proposal was also made that children’s programming be considered PNI. In the online consultation and during the intervention period, many Canadians commented on the importance of Canadian drama, children’s programming and, to a lesser extent, documentaries. Children’s programming particularly was a popular topic. For example, one Canadian was of the view that children should grow up watching Canadian content. The creative groups and others such as the CMPA, the Writers Guild, ACTRA, and the CMF all supported the continuation of PNI. The CMF stated that “four years of public policy and regulatory support have made a difference. Canadians are watching high-quality Canadian programs in prime time.” The Ontario Ministry of Tourism, Culture and Sport stated that PNI is important to Ontario. Most of the interveners who made comments on the PNI expenditure requirements for French-language services were in favour of maintaining or increasing the requirements. Bell supported maintaining the requirements imposed on its specialty services in exchange for maintaining the genre exclusivity policy and access rights for French-language Category A services. UDA, SARTEC and ARRQ were of the view that PNI continue to be the cornerstone of French-language television, but that the current requirements, unevenly imposed on the various French-language services, are not providing sufficient protection for these categories. They also noted that TVA Group does not currently have a condition of licence towards exhibition or expenditures on PNI, and that V Média has a minimal exhibition requirement. UDA, SARTEC and ARRQ were of the view that the status quo would be preferable to the complete removal of all requirements to that effect, but that it would prefer to see targeted conditions of licence on each service, with specific minimum levels for each program category. Only Corus proposed to eliminate the PNI expenditure requirements for French-language specialty services, arguing that these program categories already receive adequate support from funding mechanisms such as the CMF and tax credits, especially given that foreign online broadcasters are not subject to the same requirements. With respect to children’s programming, the majority of interveners supported its inclusion in the definition of PNI. On Screen Manitoba submitted that creating a children’s programming category would provide a measurable approach to ensuring that Canadians of all ages have access to quality original Canadian programming. The Shaw Rocket Fund and the Youth Media Alliance supported adding children’s programming to the PNI definition. However, the Shaw Rocket Fund further stated that without a minimum guaranteed spend there is no guarantee that more children’s programming will be produced. The Commission considers that PNI expenditure requirements continue to be an appropriate tool for ensuring that Canadians have access to the maximum number of programs from program categories that are of national interest and that require continued regulatory support. This view was also shared by a vast number of interveners, including individual Canadians who participated in the proceeding. PNI requirements were introduced in the English-language market in 2011, in the French-language market in 2012 and for CBC services in 2013. When the broadcasting licences for Rogers’ services were renewed in 2014, the PNI requirements were made consistent with the other English-language ownership groups. Given the relatively short timeframe in which the PNI requirements have been in place, the Commission considers it would be premature to alter the policy at this time. The current requirements relating to PNI including the specific program categories in each linguistic market will therefore be maintained. For services in the French-language market, the Commission will examine the PNI requirements at their next licence renewals. The Commission will consider the specific situation of each service, including its membership in ownership groups of various sizes and situations, in determining requirements. The Commission also considers that the condition of licence requiring that at least 75% of the spending requirement for PNI be allocated to independently produced programs is one of the means by which the objective in the Act relating to the independent sector is fulfilled and should therefore be maintained. As parties pointed out at the hearing, there is currently no test to determine whether it is necessary to support particular types of programming through regulatory measures such as PNI. In its intervention and at the hearing, Bell suggested that risk (meaning the financial risk of producing or acquiring programming that has a potential for low profit returns or unrecoverable costs) be a factor in deciding whether a certain type of program be considered PNI. Section 3(1)(d)(ii) of the Act sets out the objective that the broadcasting system should provide Canadians with a wide range of programming that reflects Canadian attitudes, opinions, ideas, values and creativity. Therefore, any test to determine whether a particular type of program should be considered PNI should ensure that it helps meet this objective of the Act. When considering if certain types of programming require regulatory support, the Commission must take into consideration whether specific outcomes or objectives would be achievable without regulatory intervention. in the absence of regulatory support such programming would not otherwise be available to Canadians. The Commission will use the above test should it decide to initiate a policy proceeding to add to or remove program categories from PNI in the future. The implementation of any changes to PNI program categories would be done at the time of licence renewals. The Commission considers children’s and youth programming to be an integral part of the broadcasting system. During all phases of the Let’s Talk TV consultation, individual Canadians and other interveners wrote and spoke about the value of children’s programming and the importance of Canadian children watching Canadian programming. It is important to note that some children’s and youth programming, such as drama programs targeting children, is already included in PNI. However, as part of this proceeding, conflicting data was filed regarding the funding and production of children’s and youth programming. Consequently, the Commission recognizes that there is a need to collect more detailed data to monitor effectively the number of children’s and youth projects being certified by the Commission as well as the expenditures on this type of programming. The various regulations currently do not include any program categories devoted to children and youth that would aid in this process. Therefore, in order to monitor the creation, exhibition of and expenditures on children’s and youth programming, the Commission will issue a notice of consultation later this year to initiate a proceeding in order to create children’s and youth program subcategories. These subcategories could be based on the age groups of the target audience, such as preschool (0-4), school age (5-12) and youth (13-17). The licensing process is simplified and less burdensome. Presently, the Commission grants licences of more than 20 types to various programming services, such as conventional television, Category A and B pay and specialty, community programming, VOD, PPV, etc. Many of these types of services are subject to their own set of standard conditions of licence, in addition to the individual conditions applicable to each licence. Most broadcasters and BDUs generally supported the consolidation of licence types, although Bell and Corus suggested that this approach should not be implemented in the French-language market. Cogeco argued that this approach would only work as a simplification exercise if the Commission standardizes requirements for all services of a particular category as a whole. If individual services each have a long list of additional requirements, the licensing process would become complex. At the hearing, the CPSC stated that standard conditions of licence for discretionary services would be harmful, particularly in the French-language market. It added that this would lead specialty services to broadcast general interest programming, thus allowing them to take further advertising revenues from conventional stations, which are already in a precarious situation. Fairchild Television Ltd. indicated that it is not in the public interest to impose standard conditions of licence on all specialty Category A and B services. In its final submission, Corus also requested that, during this process, the Commission eliminate all legacy conditions of licence, which they define as unique, non-standardized conditions of licence that largely reflect commitments made when services were initially licensed. It also urged the Commission to recognize the need for greater flexibility and reduced regulatory burden when drafting the standardized conditions of licence. The CMPA stated that it supports the consolidation of programming service licences, subject to the Commission conducting a further proceeding to establish appropriate Canadian programming obligations. However, it added that any standardization of obligations associated with the consolidation of programming service licences should not result in a net decrease in Canadian programming contributions in the system. Each type of licence will have its own standard conditions of licence. Over-the-air conventional and community television stations and provincial educational services will be licensed as basic services, with individual conditions of licence that differentiate these services from other basic services. Similarly, national news and mainstream sports services will be licensed as discretionary services with additional conditions of licence unique to these services that do not apply to other discretionary services. As is currently the case, the Commission will have the option of imposing individual conditions of licence on particular services. The Commission will establish the standard requirements for each new licence category and will amend the various regulations in a later proceeding. The new licence classes will be introduced through the licence renewal process and will come into effect for each service at the beginning of its next licence term. The regulatory burden is reduced both for those discretionary services with fewer subscribers and for the Commission. The Commission currently exempts certain classes of programming services from the requirement to hold a broadcasting licence provided that they meet specific criteria set out in the relevant exemption order. The services currently exempted include certain third-language services and Category B services that serve fewer than 200,000 subscribers. In the Working Document, the Commission proposed to expand the exemption order relating to third-language programming services by eliminating exclusions for particular languages and to expand the Category B exemption order to include all discretionary services that serve fewer than 200,000 subscribers. Both of these exemption orders are currently set out in Broadcasting Order 2012-689. In its comments, Rogers indicated that there is no need for the exemption orders to be revised or simplified, since the Category B exemption order has only been in effect for a short period of time and the expansion of the third-language exemption order would do little to increase the number of these types of services. It added that the expansion of the third-language exemption order may even make it more difficult for the Commission to monitor these services. Bell stated that should the Commission eliminate genre exclusivity for third-language services, it would support exempting all such services from licensing, provided they meet minimum requirements. Bell also suggested expanding the existing exemption order relating to Category B services with fewer than 200,000 subscribers to include services that serve up to 500,000 subscribers. Asian Television Network International expressed concern over expanding the exemption order for third-language services. It suggested that such a measure would not increase flexibility for consumers and that the measure would be for administrative reasons only. IBG supported the greater use of exemption orders and the Commission’s effort to expand them, particularly to ensure that programming requirements are consistent with other regulatory requirements. IBG also expressed the view that there is a need to amend the third-language exemption order to accommodate lower Canadian content requirements for services broadcasting in certain languages. Cogeco and Sasktel both supported expanding the existing exemption orders to include additional discretionary and on-demand programming services with a low number of subscribers. The Commission considers that the current exemption orders for Category B services and for certain third-language services can be merged and expanded to include all discretionary services with fewer than 200,000 subscribers. This new exemption order will continue to maintain certain distinctions between English- and French-language services on the one hand and third-language services on the other hand, such as the lower exhibition requirements that apply to third-language services, but would otherwise impose a common set of obligations on all of these services. Merging and expanding the exemption orders in this way would not add new obligations to exempt services but would instead permit a greater number of services to register as exempt services, thereby reducing regulatory burden for broadcasters with fewer viewers and reducing burden on Commission resources. Furthermore, obligations related to adherence to a declared nature of service would be eliminated, consistent with the elimination of genre protection and further reducing the regulatory burden on these services. Accordingly, the Commission has issued today Broadcasting Order 2015-88, the merged and expanded exemption order for discretionary services. The exemption order for discretionary services will come into force once the Broadcasting Distribution Regulations are amended to include a reference to this exemption order. Until such time, the current exemption orders for Category B services and for certain third-language services will remain in force. In the past, services that preferred to operate under a broadcasting licence rather than as exempt undertakings were sometimes granted licences, despite being eligible to operate under one of the aforementioned exemption orders. Once the new exemption order comes into force, the Commission will no longer grant licences to services eligible to operate under that order. In this regard, see also Broadcasting Notice of Invitation 2013-563. BDUs with a community channel are permitted to direct a portion of their contribution to local expression expenditures. See Broadcasting Regulatory Policy 2014-459. The figures presented are from Commission and various external sources and are intended to provide a broad overview of the breadth of expenditures on Canadian programming as well as the various mechanisms that exist to support such expenditures. “Local availabilities” or “local avails” refer to periods of time within the programming of non-Canadian services in which BDUs have contracted with non-Canadian services for the right to insert announcements or promotions. Or delivered using point-to-point technology and received by way of mobile devices. A co-production is an audiovisual work produced jointly by a Canadian producer and a producer from another country with which Canada has a co-production treaty administered by Telefilm Canada. Over the last 50 years, Canada has signed audiovisual co-production treaties with 54 countries (for more information, see www.pch.gc.ca/eng/1358521061176). A co-venture is an international co-production which is not included under any of the treaties administered by Telefilm Canada. These include all ventures with co-producers of other countries that either do not have a film or television production treaty with Canada or, if there is a treaty, the co-production is not specifically covered by the treaty. For more information, refer to the Guide to the CRTC Canadian Program Certification Application Process found on the Commission website. This group includes the following members: Aboriginal Peoples Television Network, Channel Zero, Ethnic Channels Group, Fairchild Television, Stornoway and S-VOX Group of Companies. Simultaneous substitution is the temporary replacement of the signal of a non-Canadian station with that of a Canadian station when the program being broadcast is “comparable” (at least 95% the same, excluding commercials). Simultaneous substitution is carried out by BDUs, at the broadcaster’s request and occurs primarily in the English-language market, allowing Canadian broadcasters to maximize audiences and advertising revenues for the non-Canadian programs for which they have acquired the Canadian market rights. This in turn helps ensure that these broadcasters have the financial resources to contribute to the Canadian broadcasting system by producing Canadian programming. The exhibition requirements for the CBC networks remain unchanged. Currently, these services are APTN, CPAC, AMI-tv, AMI-tv français and TV5/UNIS in all markets; RDI, TVA, The Weather Network and AMI-audio in English-language markets; CBC News Network, Météomédia, Canal M and Avis de Recherche in French-language markets; and the Legislative Assemblies of Nunavut and the Northwest Territories for direct-to-home satellite distributors in Nunavut and the Northwest Territories. This also includes the national news services CBC News Network, CTV News Channel, Le Canal Nouvelles and RDI. CBC News Network and RDI are currently subject to and will continue to abide by the CBC’s Journalistic Standards and Practices.